See you all again on Everest next year! It's official now, everyone is now down off the mountain, which is always a big relief! This morning the sherpas made the final trip through the Icefall and brought down the last of the camps, gear, oxygen cylinders and rubbish (before we can get our garbage deposit back, we have to send all the garbage to Namche for incineration, the cans and bottles to Kathmandu for recycling, and the O2 cylinders to airfreight for export). The sherpas are getting paid this morning at Base Camp by Ang Jangbu, and soon Greg, Eben, and Jangbu will start trekking out. Many of the climbers that left a couple days ago have reached Kathmandu already (some flew out by helicopter), and they are getting ready to make the long flights home. It has been quite a trip, one that we will never forget. Thanks for following along  we appreciate it. We had a good celebration this morning with most of the members coming down to Base Camp (the final ones will be down tomorrow). This afternoon the Dominicans started trekking out to Lukla, and most of the remaining climbers will start trekking out tomorrow. This morning (the 22nd in Nepal) we had 13 Sherpas bring down loads from the upper mountain, with 11 from South Col and 2 from Camp 3. 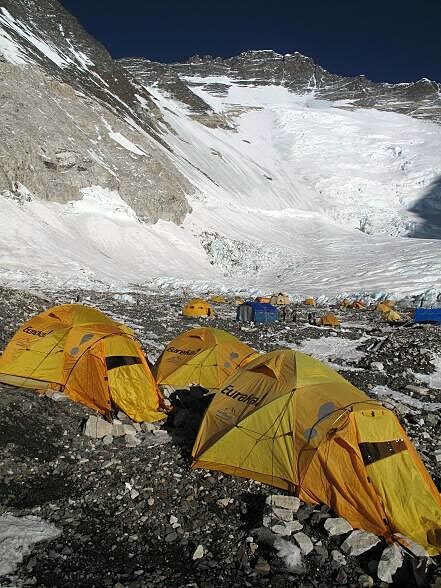 This afternoon 11 Sherpas made a down-carry to Camp 1 and then went back to Camp 2. 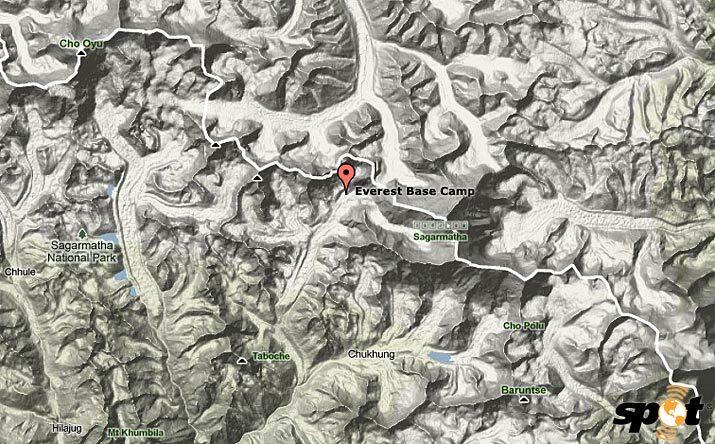 Tomorrow (the 23rd) we'll send all the Sherpas at Base Camp to Camp 2, and they will make a big down-carry to BC. 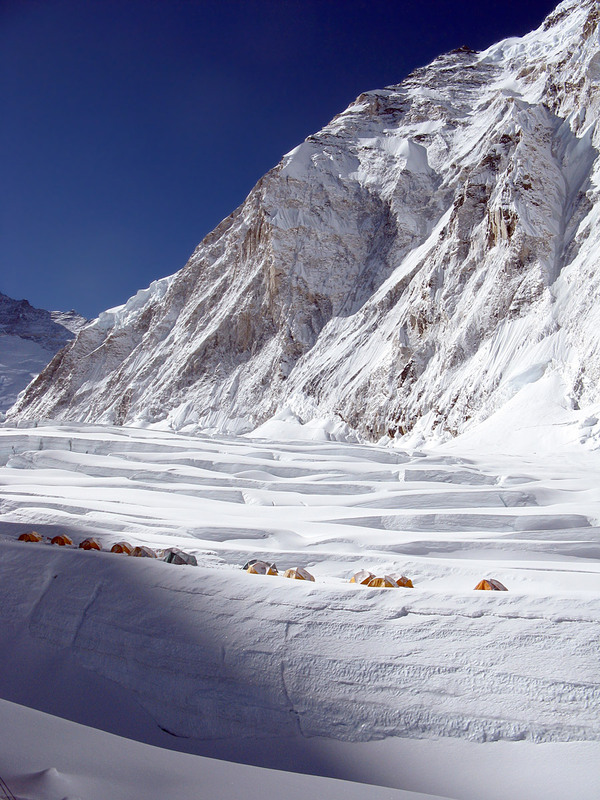 On the morning of the 24th, the Sherpas will pick up final loads from Camp 2 and Camp 1 and bring them down. 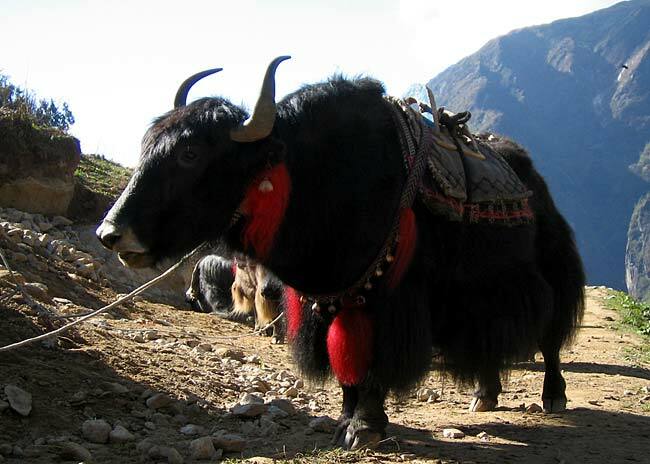 After that, Ang Pasang will supervise the drying and packing of the gear, and he has the yaks coming on the 26th to take the equipment to our store-room in Pangboche. 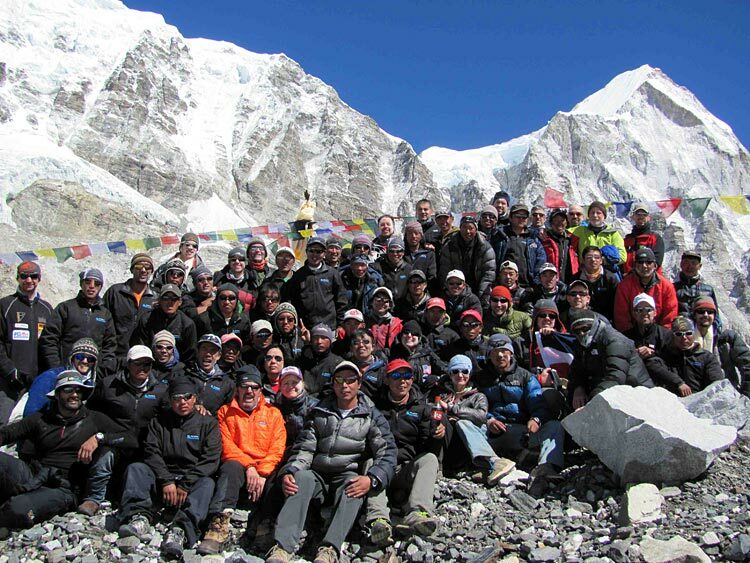 Greg reports that everyone on the Everest and Lhotse teams made it down to Camp 2 today after their summits. Great job, everyone, that is very impressive! The plan for tomorrow is that the climbers will all be coming down to Base Camp in the morning, and we have sherpa teams headed up to Camps 3 and 4 to bring down those camps. Greg said that the weather stayed good all day today, and they watched the parapont guy fly off the summit of Everest, over the top of Nuptse, and apparently he went all the way to Syangboche (above Namche)! 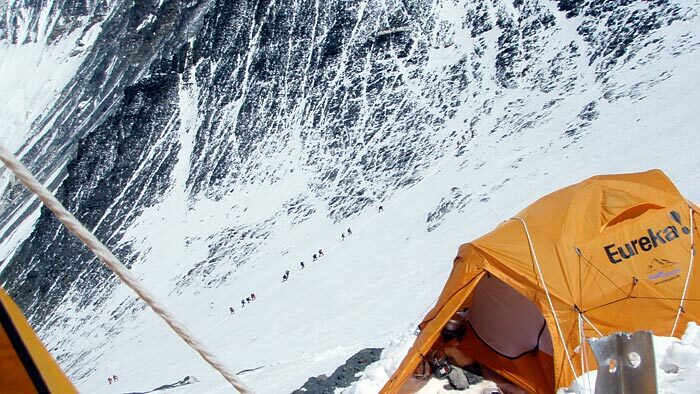 Greg Vernovage reports from BC that all the climbers have successfully made it down to the South Col and many of them are already well on their way down to Camp 2. 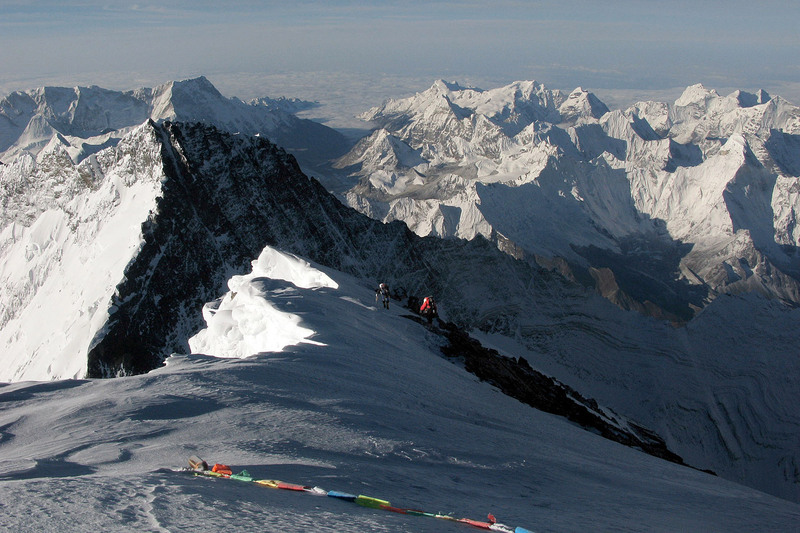 The Lhotse climbers are already down to Camp 3 and on their way to Camp 2. The weather continues to hold. So far, so good! 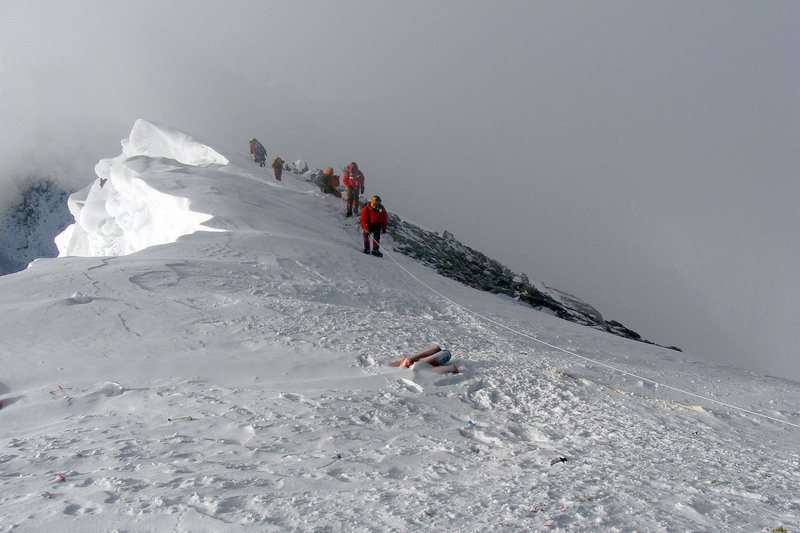 The climbers are now all on their way down from the summit. 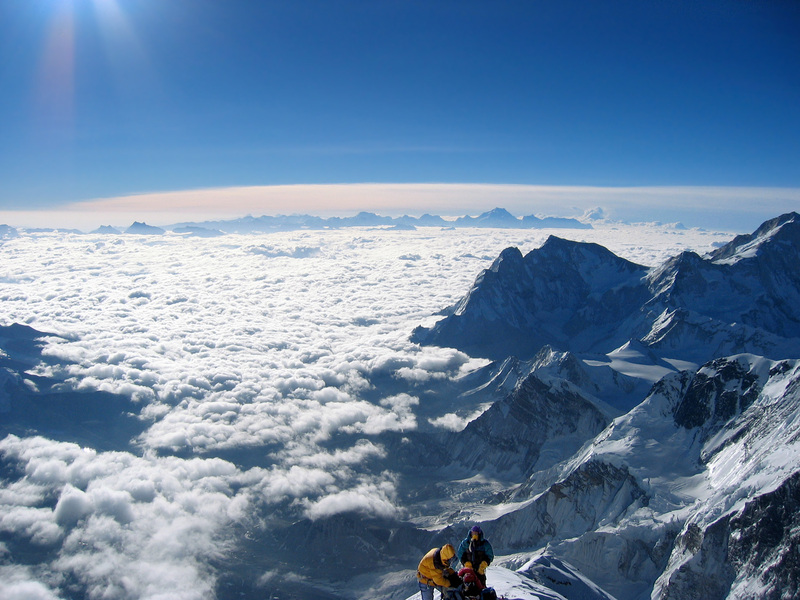 The weather and conditions on Lhotse were good today and Mark Postle, Simon Arnsby, Chewang Lendu (6th Lhotse summit) and Pemba Dorje summited Lhotse at 6:41 this morning (Saturday, May 21, 2011, Nepal Time). Their plan is to pack up Camp 4 on their way down and come all the way to Camp 2. 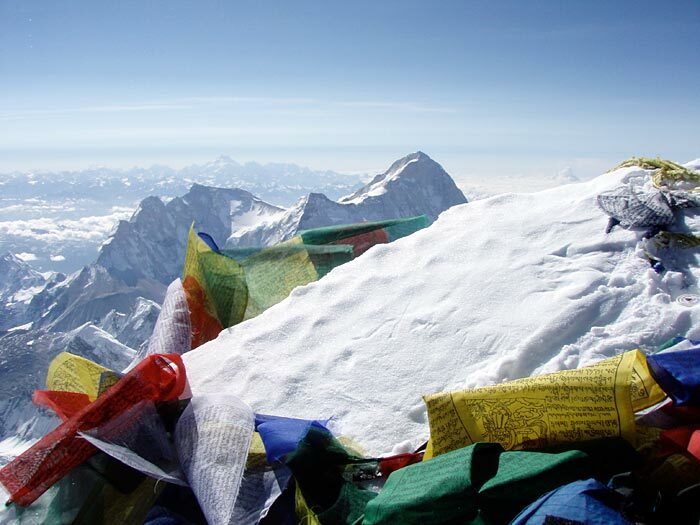 Greg reports at 6:30am Nepal time that Alan/Kami, Mirjam/Mingma Tenzing, Karim/Panuru, and Ivan/Mingma Dorje have now summitted and are on the way down. The rest of the climbers are above the South Summit and still going up. The weather is excellent. 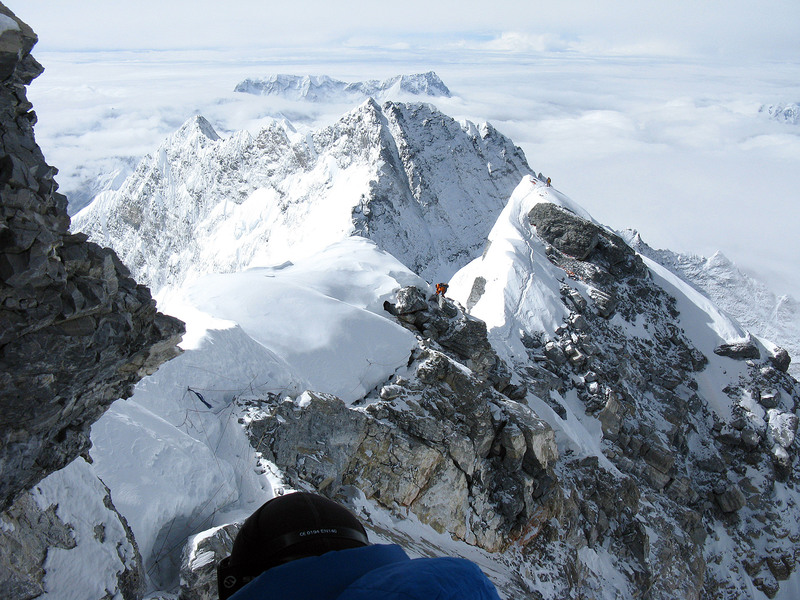 On Lhotse, the climbers are getting close. More details to follow! I talked to Greg at 4am Nepal time. The Everest climbers are now well above the Balcony and doing well. 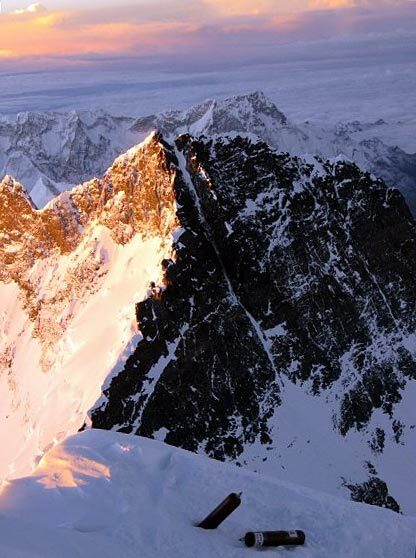 They reported seeing a light on the summit, and since our climbers are the first climbing up from the south side, it must be climbers from the north side! The Lhotse climbers are up in the couloir, and the weather seems to be OK. 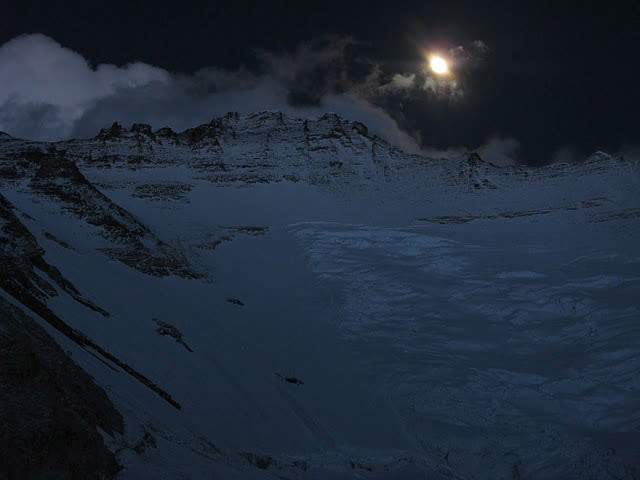 The IMG climbers left the South Col (around 9pm Nepal time). 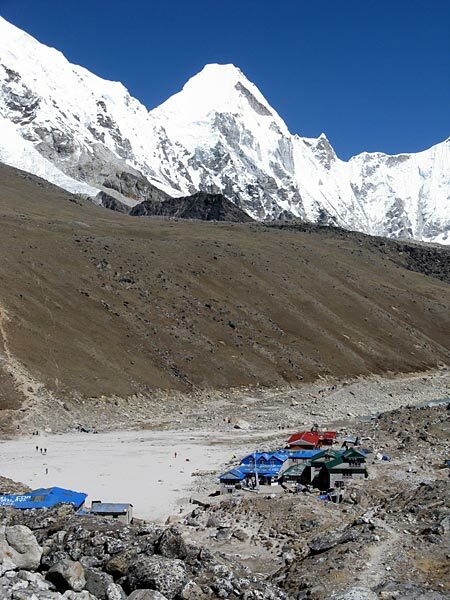 The Lhotse climbers are safely ensconced at Lhotse Camp 4 and are planning to leave about 2am. There have been some gusts and flurries this afternoon, but these were expected to settle down after dark. Greg Vernovage reports from BC on the sat phone that the weather is good this morning and that everyone is doing well. The IMG Everest climbers left Camp 3 at 5am and that by 8:30am the first of them were already reaching the South Col with the rest not far behind. So, they will have all day today for resting and preparation, before leaving tonight. The Lhotse climbers have also left Camp 3 shortly after the Everest climbers, and they are also making good time up to the Lhotse Camp 4. The Everest and Lhotse climbers along with their sherpas pulled into Camp 3 in good time and spent the afternoon resting. They plan to leave Camp 3 for the South Col at 5am. Tomorrow morning we have nine sherpas climbing to the Col from Camp 2 to carry some supplies and set up the tents, and three of them will stay up there in support for the team, while the other six will come back to Camp 2. Chewang Lendu along with three sherpas from Himex finished fixing Lhotse and reached the summit at 2:25pm. 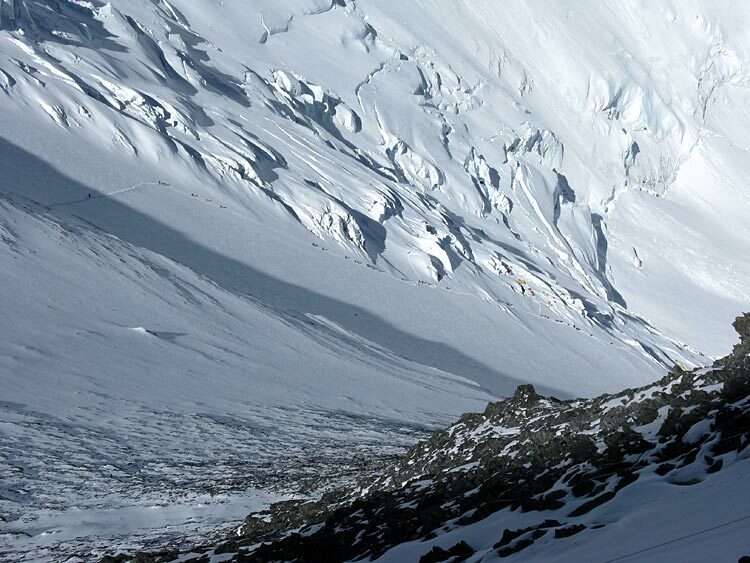 Chewang is back down at Camp 3 now and reports good conditions in the Lhotse couloir. 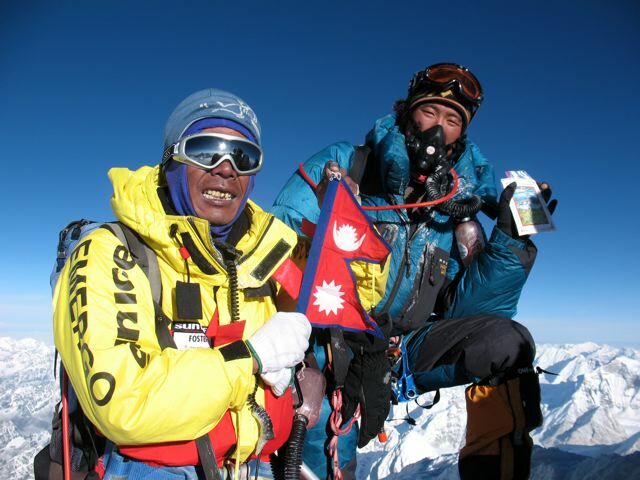 This is Chewang's fifth Lhotse summit! We have two sherpas climbing up to Lhotse Camp 4 tomorrow from Camp 2 with supplies and to set up the tents, while the Lhotse climbers Pemba Dorje, Mark, Chewang Lendu, and Simon climb up to Lhotse Camp 4 tomorrow from Camp 3. On Their Way to Camp 3! Eben reports from Camp 2 that Simon and the Dominican team left first, at 2:30am (Nepal Time), followed by the rest of the team over the next half hour. The weather is cloudy with a little fresh snowfall, but the winds are light. So far so good! Greg and Jangbu report from Base Camp that the IMG summit team had a good rest day today at Camp 2 and that everyone is feeling strong and is ready to go! 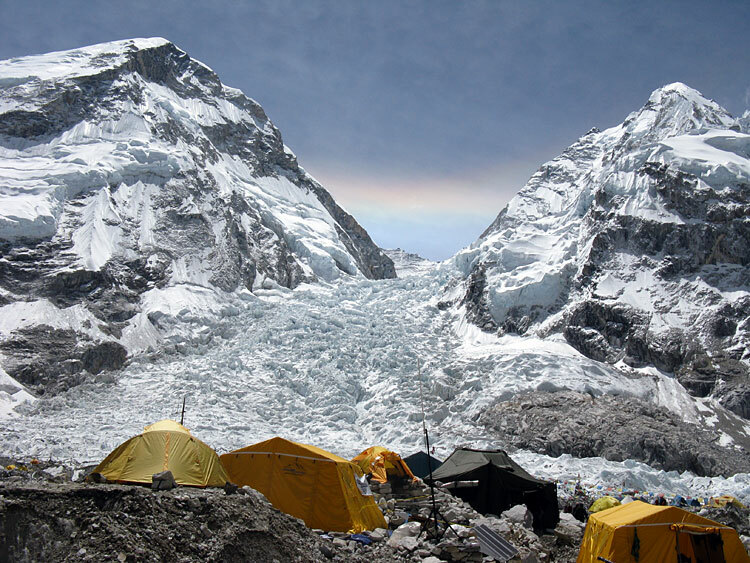 The plan for the climbers is to leave early in the morning for Camp 3, so they can get there in time to do plenty of resting and hydrating during the afternoon. Then, they will leave early the next morning for the South Col. Tomorrow we are sending up 8 sherpas ahead of the climbers to dig out Camp 3, set up some more tents, and get the camp ready for the climber's arrival. We also have 3 sherpas carrying supplies to Camp 2 tomorrow, and 6 more sherpas moving to Camp 2 to stay up there in support of the summit teams. Chewang Lendu is at Camp 2 now and will be heading up early in the morning to work on finishing the fixing on Lhotse along with some of the Himex sherpas. 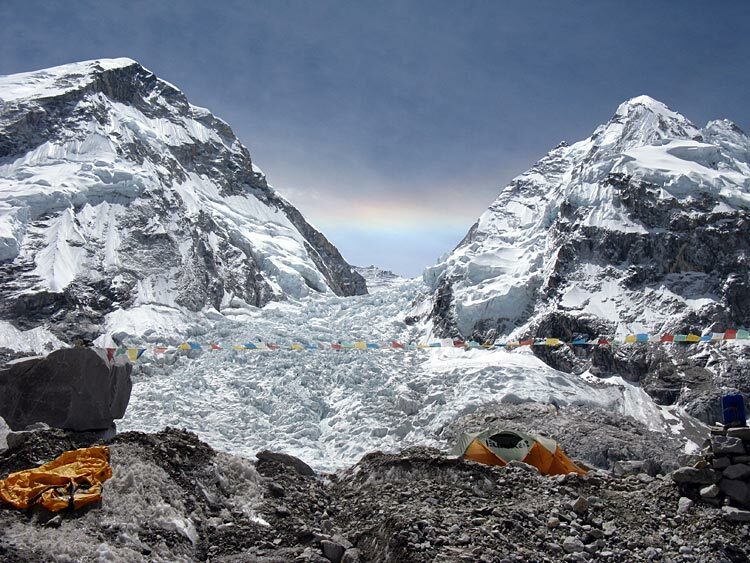 Chewang will then return to Camp 3 and meet the Lhotse climbers Simon (with Thunang) and Mark (with Pemba Dorje). Our weather forecaster Michael Fagin reports no jet stream in the region for the next several days, but there still remains the chance that some bands of wind will move through. The current satellite imagery is showing some clouds moving in and out of the region, however, this is not an organized weather system but just the normal moisture that you get as the monsoon season approaches. 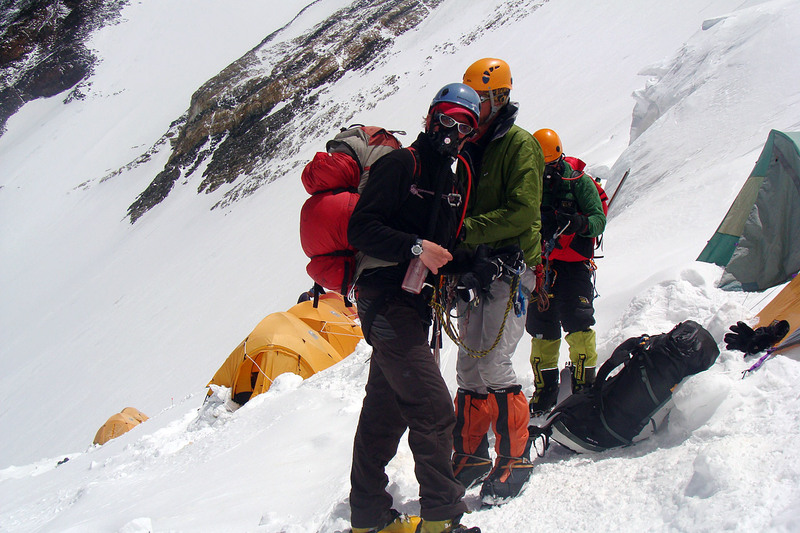 Greg and Jangbu report that all the climbers have made it up to Camp 2 in good shape. We are following the weather closely and right now the forecast for the 22nd is looking better than the 21st, so we have decided to hold everyone at Camp 2 tomorrow, for a rest day. We'll keep you posted! The members from the first summit groups are all back down and heading for home over the next few days. Some are trekking out and some are catching a helicopter ride. Congrats to all of them! 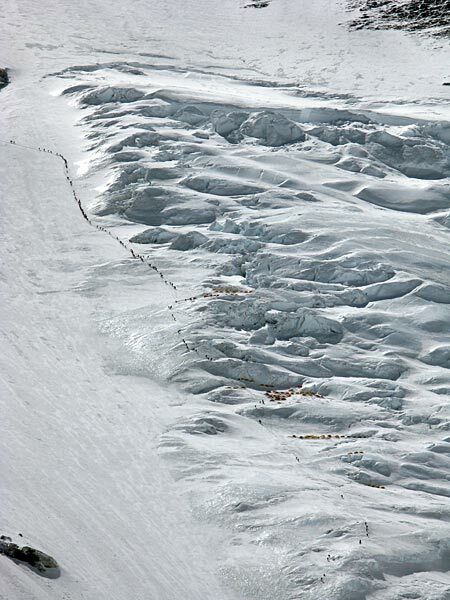 The ascending climbers had a good trip up the Icefall and are in position to move to Camp 2 tomorrow. So far the weather forecast continues to look good for the May 21 window, with the jet stream holding to the north of Everest. However, there is always the chance of some bands of wind and moisture tracking through the area at different times, so we are keeping a close watch! 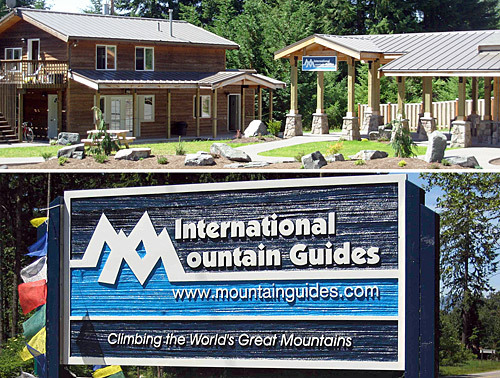 We are ready for our next group of summit climbers to start moving up to get in position. Tomorrow morning (May 17 Nepal Time) we have the following climbers moving up to Camp 1: Alan/Ang Chhiring (Kami); Jay/Phinjo; Mirjam/Mingma Tenzing 1; Rich/Pasang Yila; Heiko/Pasang Rinji; Gineth/Mingma Tshering 1; Federico/Nima Nuru. Eben moved up to Camp 2 today, and he will wait there for the climbers. Karim/Panuru and Ivan/Mingma Dorje are taking another rest day, then moving back up the following day. The Sherpas will take another rest day here at Base Camp tomorrow, and then catch up with team at Camp 2 day after tomorrow. 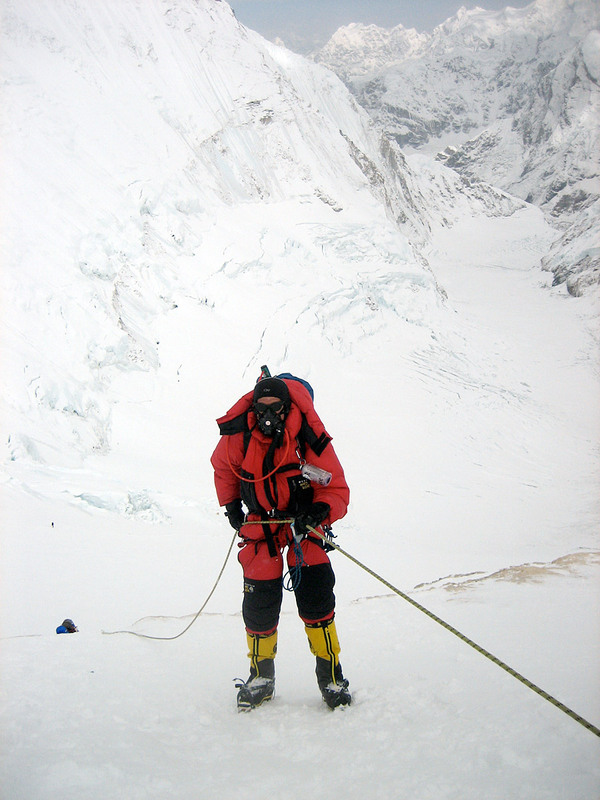 For Lhotse, we have Simon going up tomorrow, and he is planning to head on up to Camp 4 with Thunang. Mark plans to head up day after tomorrow directly to Camp 2. 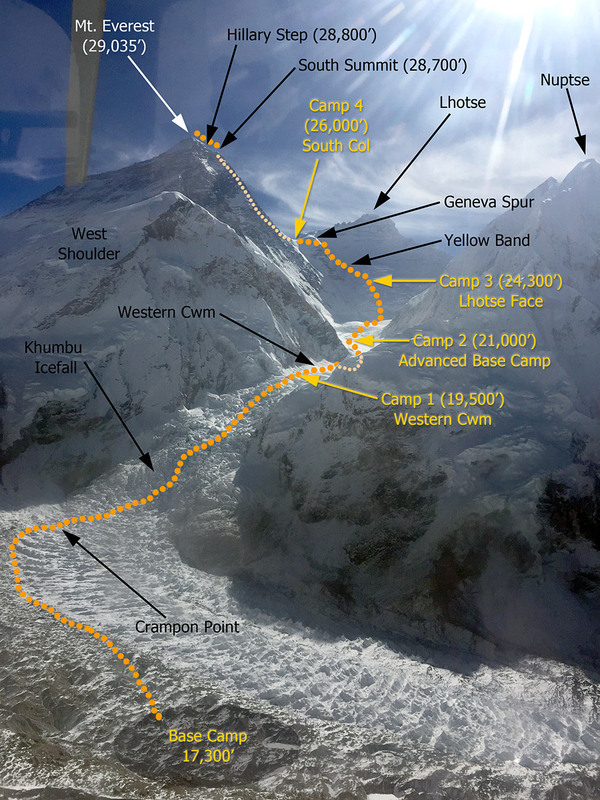 There is still some fixing that needs to be done between Lhotse Camp 4 and the Couloir, so the tentative plan is for Chewang and Pemba Dorje head up from Camp 2 early on 19th to do the fixing and then meet Mark, Simon, and Thunang at Camp 4. 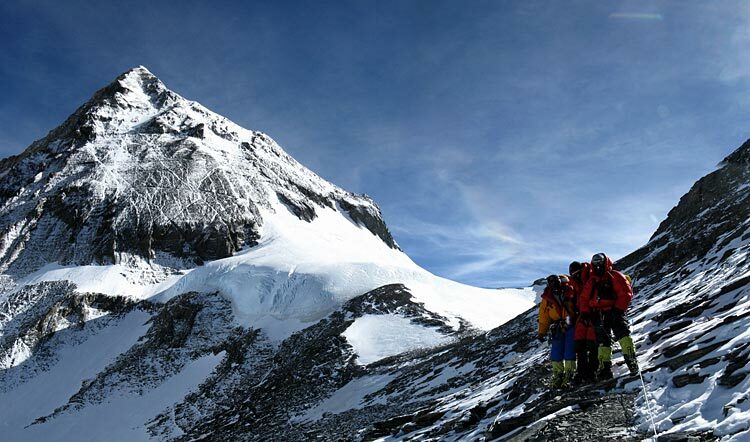 All the IMG climbers have now successfully descended to Base Camp, with the exception of Knut, Jeff, Zack, Suzanna, and Max who decided to stay at Camp 2 for a rest day. They plan to come down to Base Camp tomorrow. 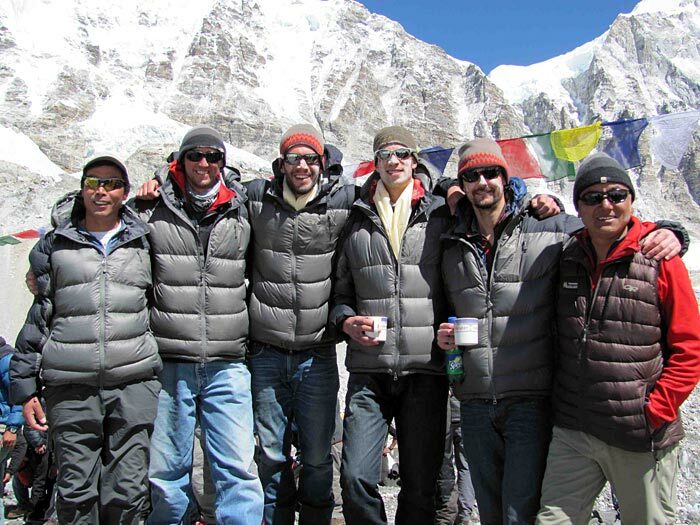 The Sherpa Trek team arrived on schedule to Base camp and they are all doing well. Today they explored the area around base camp and enjoyed the civilized life we have up here! 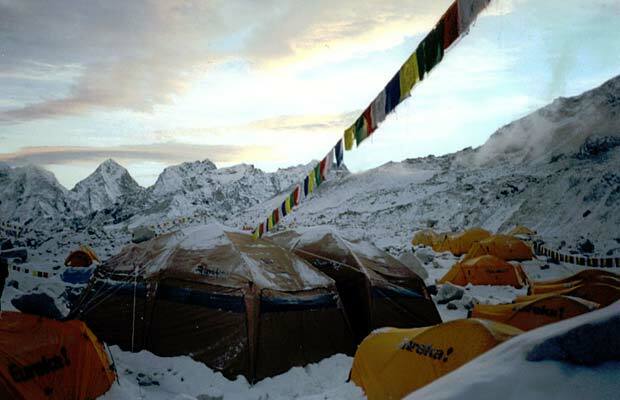 Greg Vernovage reports from Base Camp that all of the summit climbers have managed to descend to Camp 2. Good job, team! The winds up high are strengthening, so we have pulled Ang Pasang and the South Col sherpa team down, and also pulled the Camp 3 team down. Everything is on hold until we get a better forecast. The other climbers at Base Camp are getting well rested and prepared, so as soon as it looks good, we will launch the next summit bids. The last members are now nearing the Balcony on the descent. The weather is still clear and windy. 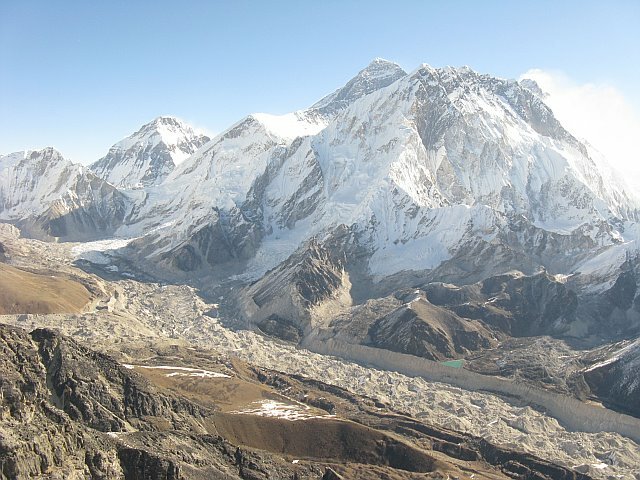 Greg Vernovage reports from Base Camp that most of the second IMG team reached the summit, and they are already below the Hillary Step on the descent. The weather is clear, but it continues to be windy. 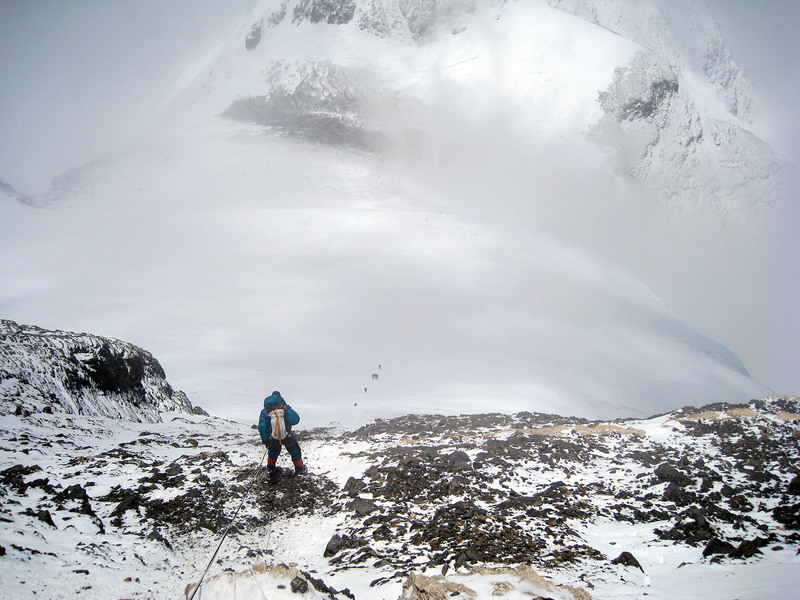 At the South Col it is also windy, so the ascending climbers at Camp 3 are holding there for now and not climbing. 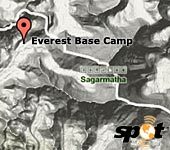 Greg Vernovage reports from Base Camp that the team has now left the Balcony (1:15am Nepal time) and is continuing up. 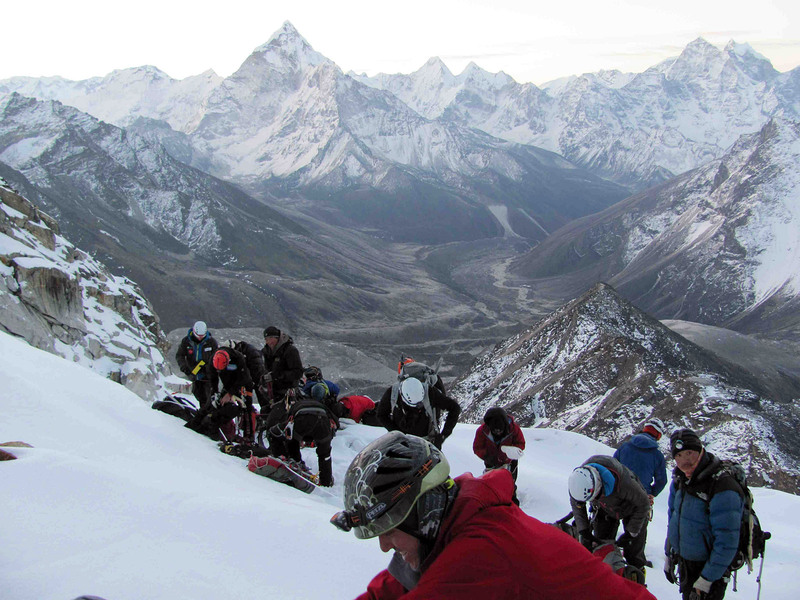 They have been dealing with some gusty wind but so far it is not too bad, and everyone is doing OK.
Greg Vernovage reports by sat phone that the second team is just about ready to leave the Col (9pm Nepal time) and head up. Climbing tonight we have Jeff and Danuru, Zach and Phu Tashi, Steve and Dorje Lama, Suzanna and Dawa, Graham and Nima Karma, and Dave with Kancha Nuru. 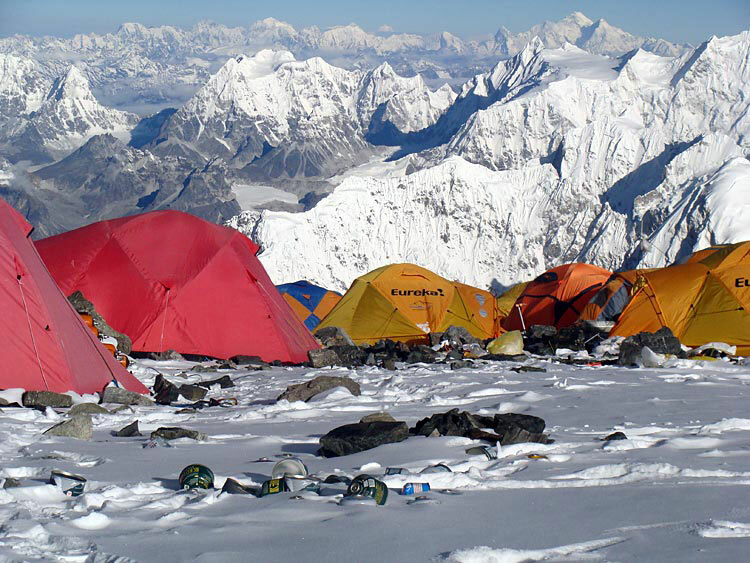 Many of yesterday's summit climbers were able to continue their descent and made it down to Camp 2, while a couple of them stayed at Camp 4 for another night. At Camp 3 right now we have Karim and Panuru, and Ivan with Mingma Dorje. So far the weather continues to hold, with the jet stream several hundred miles to the north of Everest, but with occasional bands of gusty winds coming through. We'll keep you posted! 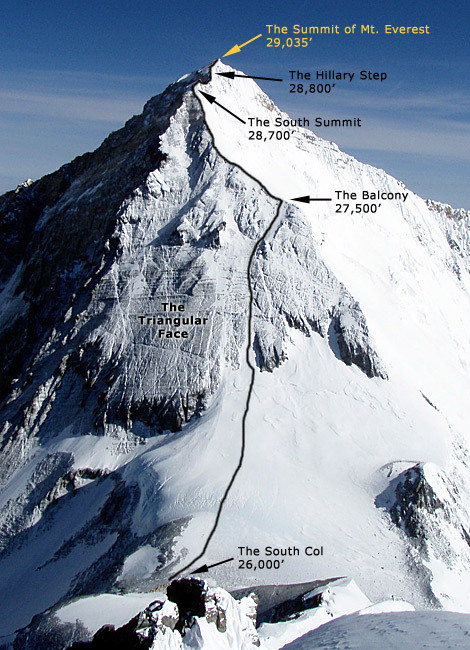 Most of today's summit climbers are now back to the South Col, and the others are well below the Balcony, descending steadily. The weather is still nice up high. 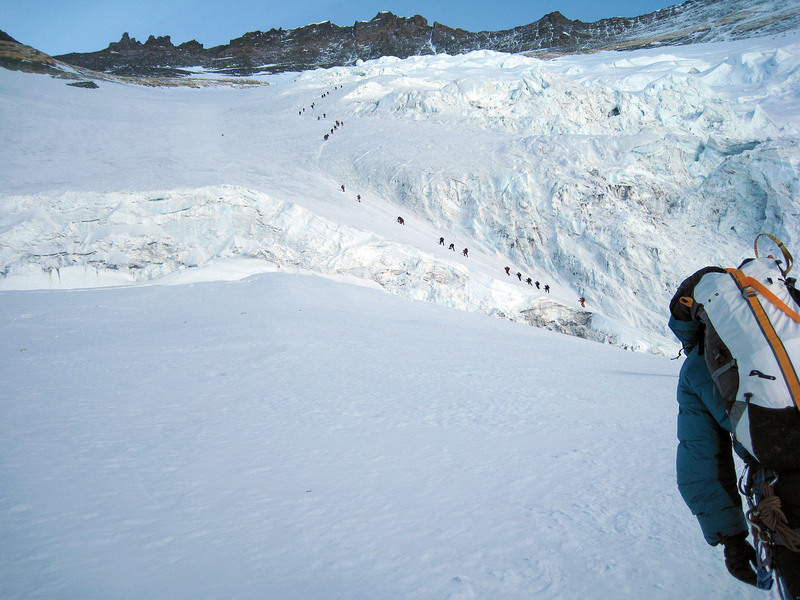 Dave P, Austin, Jeff, Zach, Suzanna and Steve are pulling into the South Col now from Camp 3. Karim and Ivan have now moved up to Camp 3. The team members are on their way down from the summit now. So far the weather is holding OK.
Greg and Jangbu report that our team has now left the Balcony (3am Nepal time) and are continuing up. So far the weather is holding. Greg and Jangbu report from Base Camp that the first summit team had a good climb up to the Col today, and the second team did a good job getting up to Camp 3. During the afternoon, however, the weather deteriorated and the winds became quite gusty, prompting us to wonder whether or not we would have to stand down on the summit bids. However, at 9pm, Mike Hamill radioed down from the South Col to say that the winds had dropped substantially and that the team was up, getting dressed and was going to take a shot! They have now left and are heading for the Balcony. Right now the jet stream is still holding about 300 miles north of the mountain, but the long term forecast does have it moving back into the Everest area this next week. We are keeping a close eye on the weather and will keep you posted! The weather report is good and we are sending the first IMG teams up! Today IMG guides Hamill and Bunce, along with Walt, Knut, Mike, Dave, Martin, Karma Rita, Phinjo Dorje, Kalden Phura, Pasang Nuru, and Kancha Nuru left Camp 2 early in the morning and made good time moving to Camp 3, where they spent the day resting. Tomorrow they will do the same, getting an early start to get to Camp 4 in time for a good rest before trying for the summit. Also moving up to the South Col with them in support will be Samduk Dorje and Dasona. Back at Camp 2 our next team has been resting today and they are ready to go to leave for Camp 3 early in the morning: Jeff and Danuru, Zach and Phu Tashi, Steve and Dorje Lama, Suzanna and Dawa, Graham and Nima Karma, and Dave with Kancha Nuru. Tomorrow moving up to Camp 2 we have George and Thunang, Karim and Panuru, and Ivan with Mingma Dorje. Down at Base Camp the rest of the team members are getting ready. We'll keep a close watch on the weather forecast and keep you posted on the progress of the team! It snowed about 3 inches down here at Base Camp this afternoon and also a little up in the Western Cwm. Chewang Lendu and Samduk Dorje went to Camp 3 to check on tents after the big windstorm. We have to replace one of them, but otherwise we are OK.
Federico and Nima Nuru are sleeping at Camp 3 tonight. Walt, Knut, Mike, Dave, Martin, along with Hamill and Bunce had a rest day at Camp 2 today, and they are all set to head up to Camp 3 tomorrow leaving at 3am. Zach, Jeff, Steve, Suzanna, Graham and Dave P. went from BC to Camp 2 today. They will take a rest day tomorrow and plan to go up next day. George made it to Camp 1 with Thunang and is doing well. Early tomorrow morning we have Karim and Ivan with Panuru and Mingma Dorje, and also Justin and Larry with Tseten Dorje leaving Base Camp and heading up. 14 Sherpas including Ang Pasang are now at Camp 2, and tomorrow 11 Sherpas will carry to the South Col, while 2 Sherpas (Chewang Lendu and Pemba Dorje) will carry to Lhotse high camp. 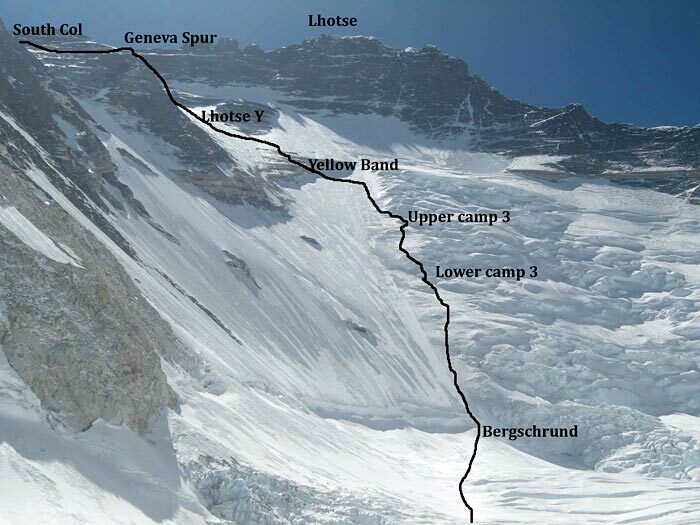 3 Sherpas will carry Hybrid personal gear to Camp 3. 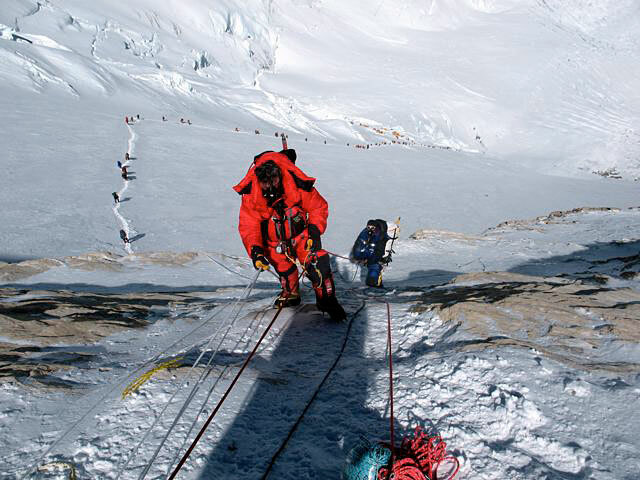 We have 3 Sherpas down here at Base Camp to do round-trip carries to Camp 2. The updated Lhotse fixing plan (scheduled for the 13th) has IMG sherpas Chewang Lendu and Pemba Dorje along with two Himex sherpas, two AAI sherpas, and maybe also some Asian Trek sherpas fixing to the summit that day. More news tomorrow! 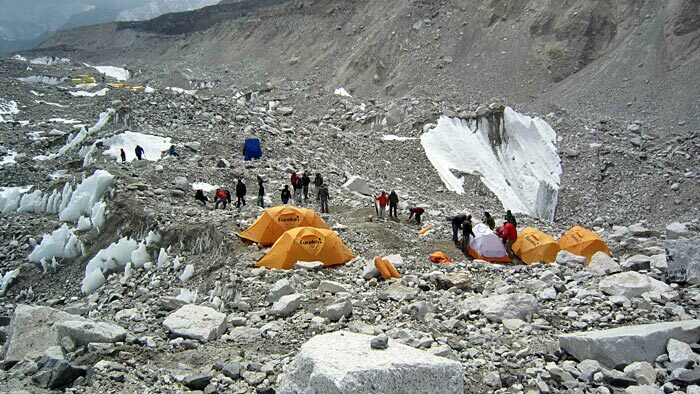 The last couple days were very windy but all our camps are intact, with only one tent pole broken at Camp 3. The weather report is improving and we are getting ready for summit bids! This morning the Hybrid team left Base Camp very early and made it to Camp 2. The wind dropped, and they report that it was very hot up in the Western Cwm. They are resting tomorrow and plan to go up the next day to Camp 3. Heiko and Pasang Rinji are sleeping at Camp 3 now, and Federico is going up to Camp 3 tomorrow. Tomorrow we have Zach, Jeff, Steve, Graham, Suzanna and Dave and three sherpas carrying gear, all heading for Camp 2 from Base Camp. George is heading for Camp 1 in the morning, and Chewang Lendu and Samduk Dorje are at Camp 2, from where they will go to Camp 3 tomorrow to set up more tents. 14 Regular sherpas and sirdar Ang Pasang are moving to Camp 2 tomorrow to get ready to finish the carries to Camp 4 at the South Col. The windstorm delayed the fixing of the route up Lhotse, but this is now scheduled for May 13th. A quick update from Everest Base Camp. As we progress into the month of May here on Everest, we keep one eye on the weather and the other on our preparations. This time of the season a different look comes to the faces of the climbers. After coming down from the Camp 3 rotation we rest for a few days, and you can tell by the look in peoples' eye. I think it is the summit look. They have worked hard to put themselves into position for a summit opportunity. Now they WANT it! The team is looking forward to hearing that the weather window is there. Until then, it is Base Camp living and staring at the Mountain. I love this time of the season. Thanks for all your support! It has been very windy the last 24 hours at Mt Everest, with the jet stream hitting the peak and blasting all the way down to Camp 2. 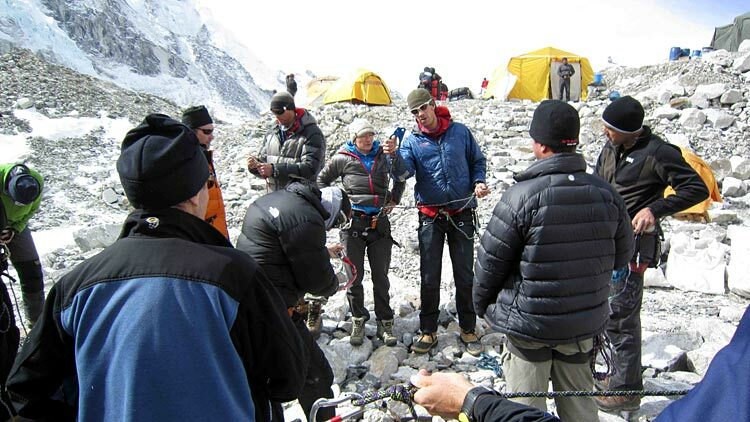 Alan, Mirjam and Jay with their Sherpas Kami, Mingma Tenzing and Phinjo had a very windy night at Camp 3 yesterday. 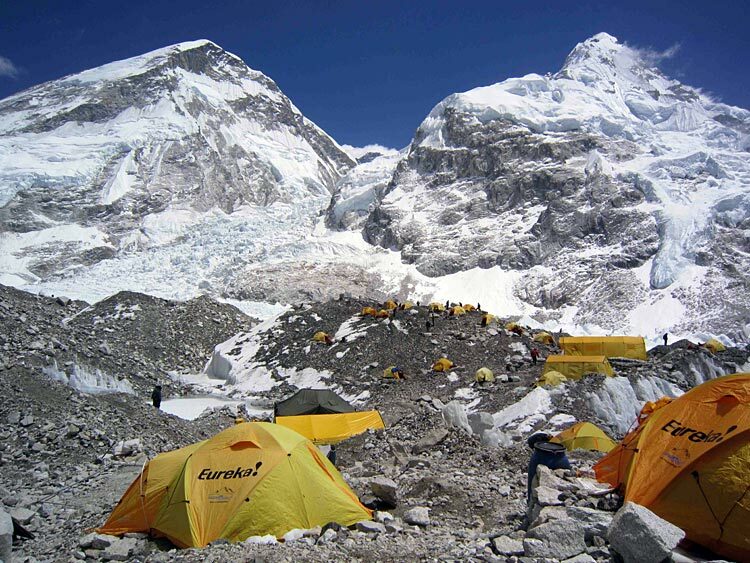 They are now safely down at Camp 2 and they plan to come down to Base Camp tomorrow morning. Other members up at camp 2 are Heiko and Frederico. They will go to camp 3 tomorrow to sleep (weather dependent). The rest of the members are all here at Base Camp except for a few that have gone down to Pheriche/Debochje for a low altitude rest before the summit bids. Right now we are just waiting for a good weather forecast! Everyone wishes their loved ones back home a happy Mother's Day! 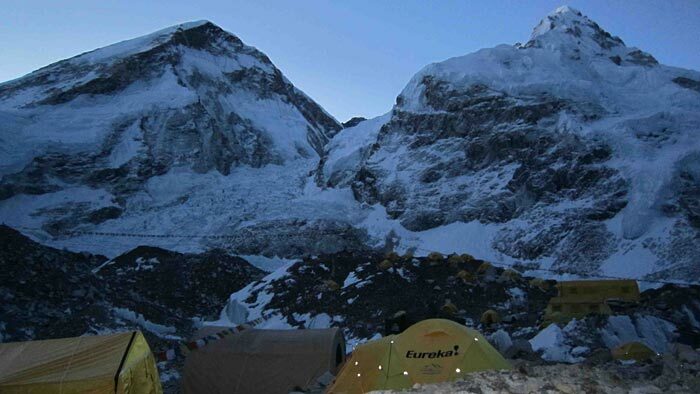 IMG climbers Alan, Jay and Mirjam with their Sherpas Kami, Mingma Tenzing and Phinjo are sleeping at Camp 3 tonight. 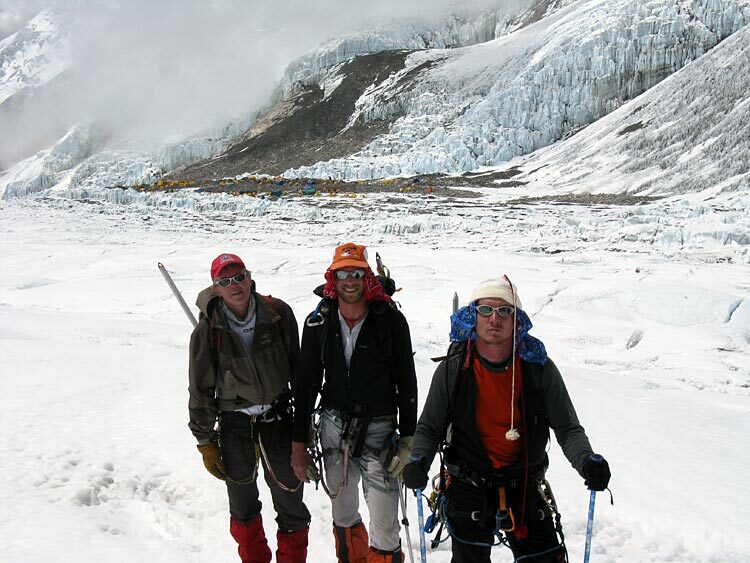 At Camp 2 we have Heiko and Frederico with their Sherpas. Our other climbers are all down at Base Camp resting for summit bids. At this point it all depends on the long term weather forecast! Greg and I went to Russell's camp to discuss Lhotse fixing, and our plan is to start on the 11th. 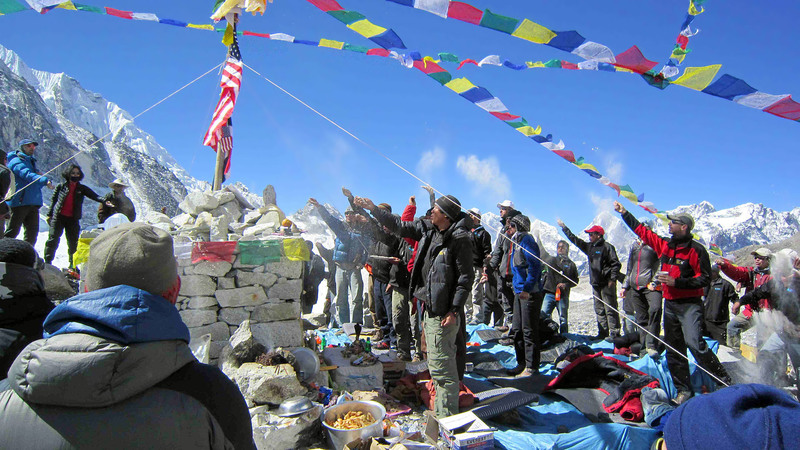 We are sending IMG sherpa Chewang Lendu (4x Lhotse summiter) to help. 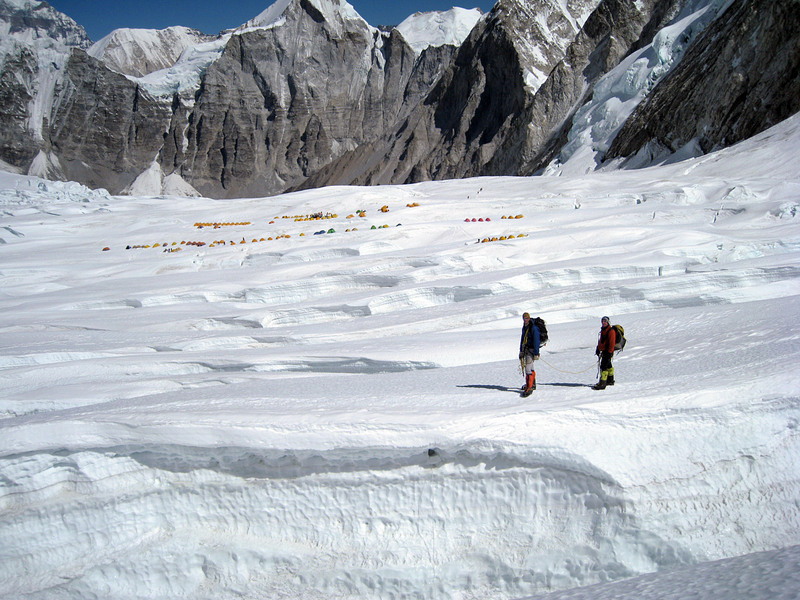 The sherpas plan to start from Camp 2 and use oxygen. 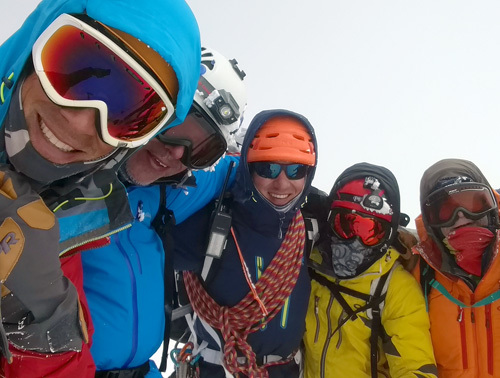 Two Brazilians plus two sherpas reached the summit this morning. The door to the summit is open now! 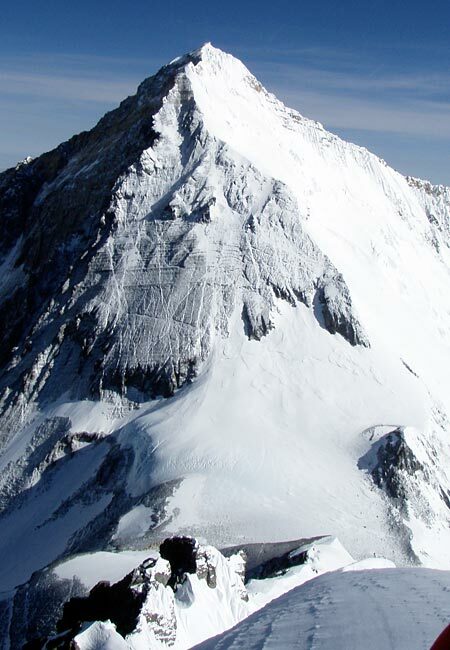 Today, 5 more people reached the summit (Kenton Kool and Sebastian from the Samsung Team) along with two sherpas and a lone climber from Asian Trek. There are maybe a few more people going for the summit tonight  maybe three Brazilians climbing with Asian Trek who were at Camp 3 this morning. We had 9 sherpas carry oxygen bottles to the Col today, and now all the regular sherpas are coming down from camp 2 for a rest. Most of them will go back up in a couple days time to finish carrying to the Col and Lhotse C4. 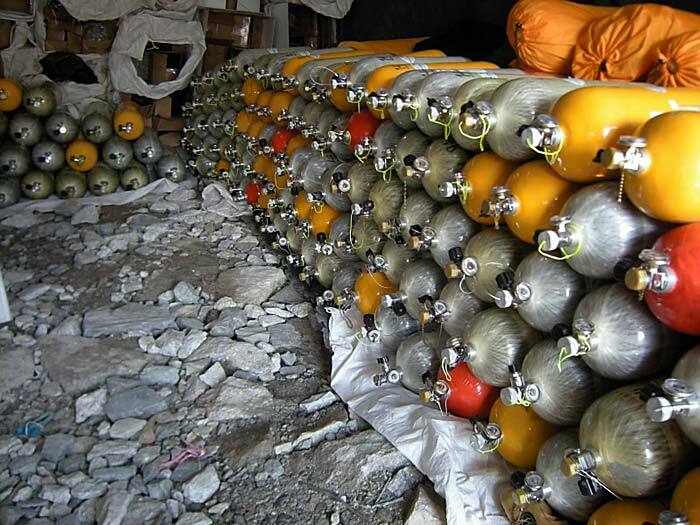 We already have 66 bottles of oxygen at the Col but still need to send more O2, tents and gear. IMG members at Camp 2 now include Heiko (went up this morning from BC); Karim (tagged C3 today); Rich and Ivan (spent last night at C3); Mirjam, Jay, Alan (going to C3 tomorrow); Mario and Mark (going to BC tomorrow); Federico is at C1 while Steve, Zach, Jeff, Gineth, Larry, Justin, David, and George descended to Base Camp today. 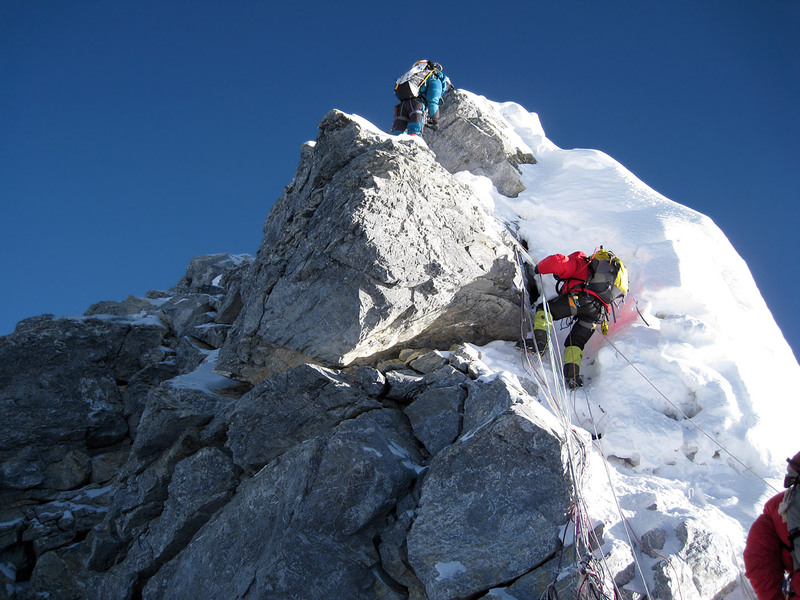 Today the IMG sherpas Phu Tshering and Karma Gyalzen, and the rest of the fixing team reached the summit! They started at 1am at Camp 2, climbed to the Col in time for breakfast, fixed to the Balcony in 4 hours, and decided to keep going! The conditions up high were perfect, and they reached the summit at 4pm (May 6 Nepal time) and got safely back down on the Col at 5:50pm. They are leaving South Col at 6:30pm and heading for Camp 2 tonight! The route was on snow most of the way (some years it gets quite rocky above the Col) and there was quite a lot of snow up on the summit ridge and Hillary Step. All total they fixed 1600 meters of rope on the way up and are setting double ropes on their descent in the steep places. 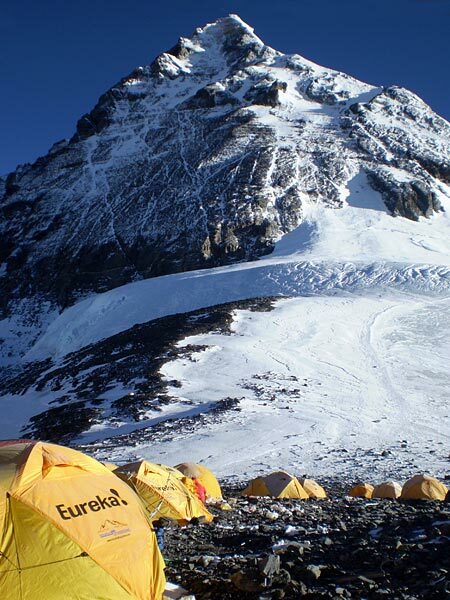 The summit fixing sherpas started early this morning from Camp 2 and climbed to the South Col this morning; they have now left the South Col (7:30am) to start fixing. They will try to get to the Balcony today. 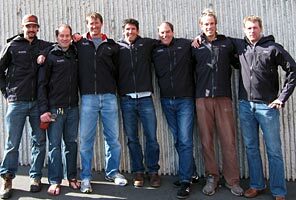 There are 8 sherpas (2 from IMG) plus Adrian in the fixing team. IMG climbers Jeff, Zach, Steve, David, Suzanna and Graham have all slept at Camp 3 now, and they are on the way back down. Yesterday Eben, Simon, and Jay tagged Camp 3, and then Jay and Ang Pasang continued up and tagged the Yellow Band. They are now descending to Base Camp. Tom and Mark are taking a rest day at Camp 2 while Larry and Justin slept at Camp 2 and are now heading down to Camp 1. Ivan and Rich are on their way to Camp 3 right now and Karim and Federico will go up to Camp 3 tomorrow. Alan, Mirjam, Jay and Mario went from up from Base Camp to Camp 1 this morning and are doing well. IMG climbers Heiko, Suzanna, Graham, Frederico, Jeff, Zach, Steve, Karim, Dave, Eben, Tom, Mark, Jay and Simon have now all moved up to Camp 2 with their sherpas. Some overnighted at Camp 1 en route and some went all the way to Camp 2 from Base Camp. Justin, Larry, and Rich are at Camp 1 and will be moving to Camp 2 in the morning. 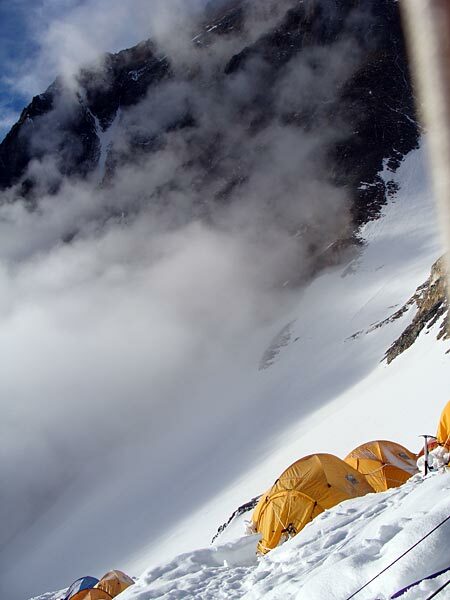 Hybrid climbers are back to Camp 2 and will descend tomorrow. 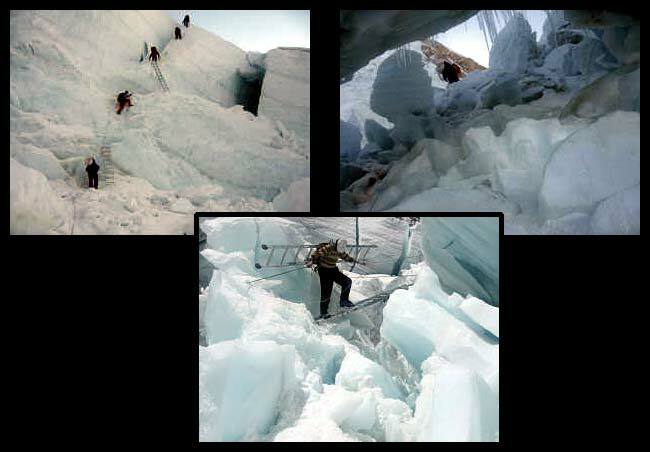 Mario did an ice fall foray with Passang today and George is doing the same tomorrow with Thunang. The rest of the Classic members are taking another rest day at base camp. We had 7 sherpas carry from BC to Camp 2 today, and tomorrow we have the first 9 sherpas carrying to the South Col. We are sending the rest of the regular sherpas up from Base Camp to Camp 2 tomorrow to make more carries to the Col while the weather is good and while most of the climbers are doing their second rotation. Himex sherpas fixed the route to Lhotse Camp 4 yesterday, and we'll be sending tents and gear up there too in the next couple days. 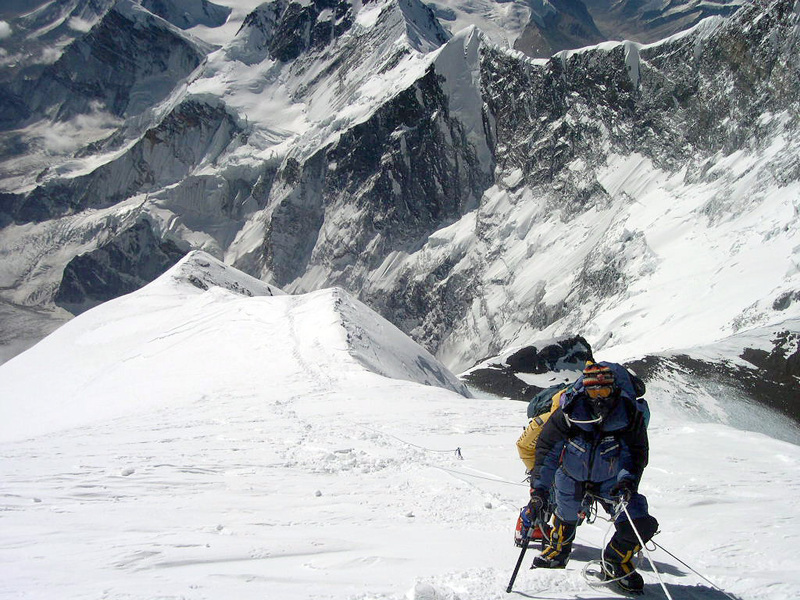 Summit fixing is projected to happen on the 5th and 6th, and we are sending two IMG sherpas to this effort. The route to the Col is open! Today the IMG sherpas Phu Tshering and Karma Gyalzen finished fixing to the Col along with some sherpas from Himex and Willie's team. Yesterday they had made it to below Geneva Spur, and today they finished the job. Way to go! We are continuing to move up Mount Everest. Weather is coming and going and the Team is staying focused and determined. 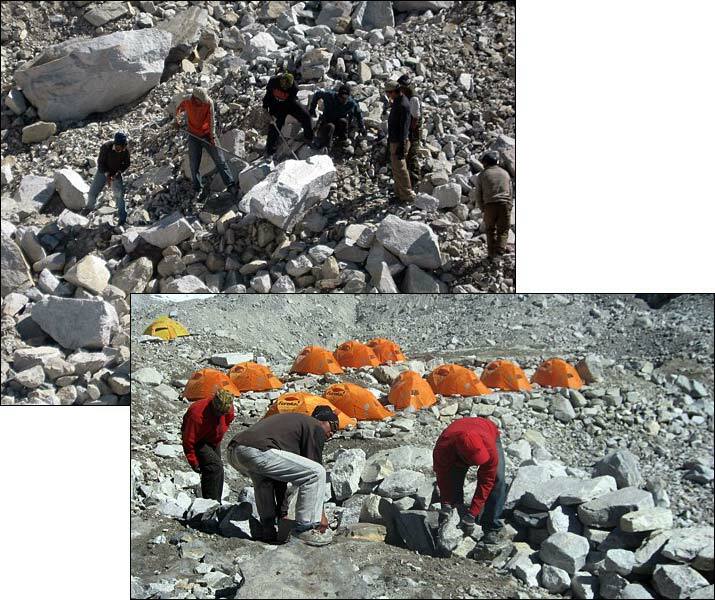 Today our sirdar Ang Pasang and the sherpas hacked out 8 tent platforms at Camp 3 and will be putting up tents tomorrow. The Hybrid team is at Camp 2 and ready to climb up the Lhotse Face to Camp 3 for the first time. Call it a dress rehearsal if you want. As some of you know it is a big test! For those climbers out there who are unaware of this rotation, it is one of the toughest challenges in big mountain climbing. 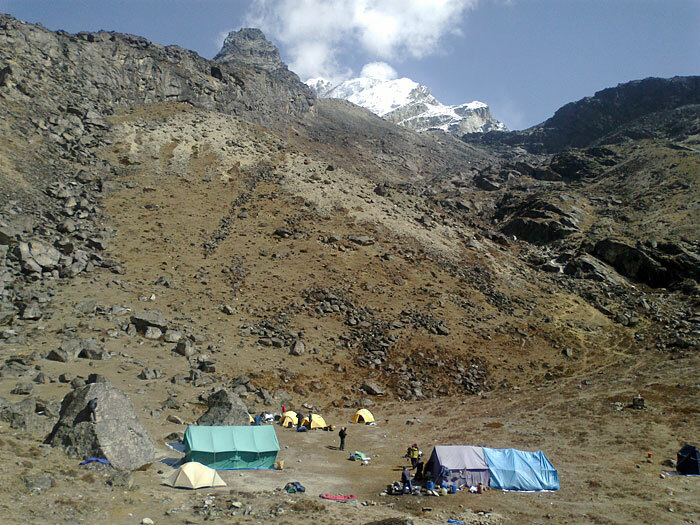 Camp 3 is on the Lhotse Face, and the team will leave Camp 2 early in the morning and head up hill. Arriving at Camp 3 will give you a great view high above Pumori; on a clear day we will be able to see Cho Oyu and Shishapangma. Our goal is sleeping at Camp 3, without oxygen, at an altitude of 7,300 meters, to get our bodies to start adjusting to higher altitude. Knowing that you can handle this elevation without oxygen is a great confidence builder for the summit bids (on summit bids we will use oxygen starting with the overnight at Camp 3). We are planning a number of waves to Camp 3. 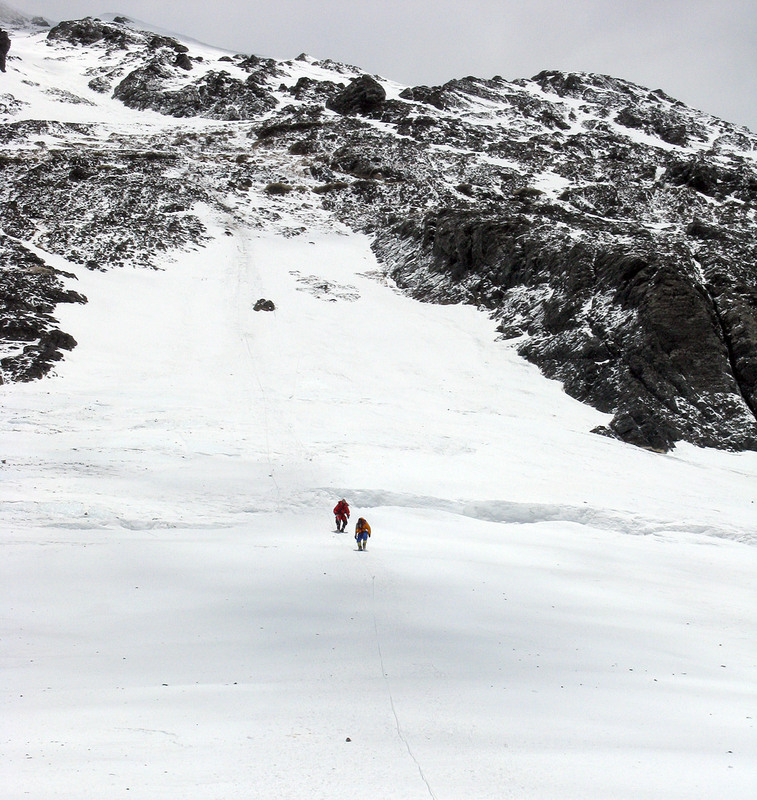 This climb is tough, the reward is the confidence and strength to do it again on our final push to the South Col and Summit. 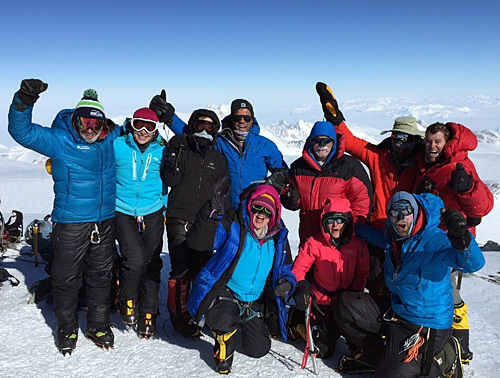 After the Hybrid team finishes their Camp 3 stint, we have the Lhotse gang and the Classic team behind them. We have been going through our scenarios at base camp and everyone is looking to "Fine Tune" their systems. After the added challenge of the Lhotse Face, the team will return to Base Camp, rest and reload their energy for the summit push. The Mountain preparation is going great! 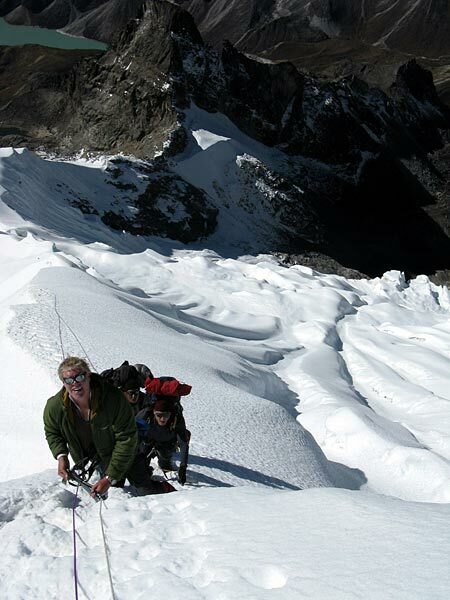 The Sherpa Team has fixed the route to the South Col. As Jangbu says, we are almost half way there. 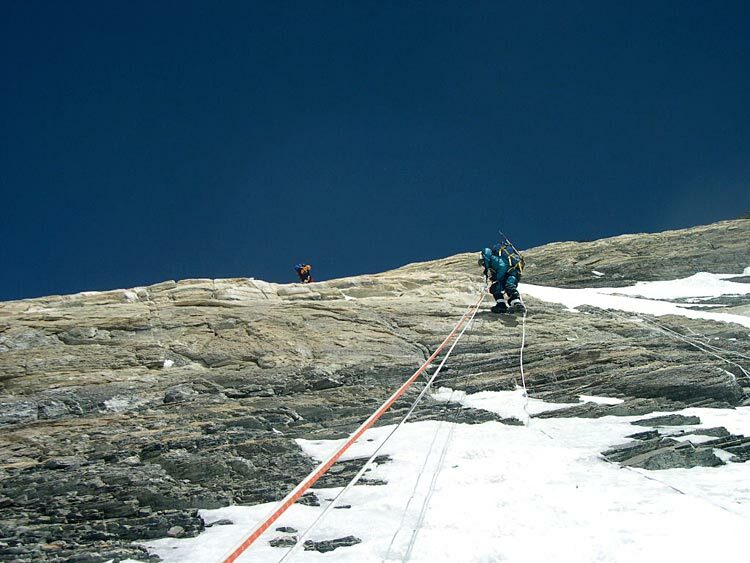 With the route open to the South Col, we can now focus on getting the rope and safety gear up there. This Sherpa team is doing a great job, giving a huge effort. The snow that fell on the Face stuck a bit and turned into some pretty sweet steps for our climbers. I hope it stays that way, nicer than the blue ice that is usually there. It is the 30th today and that means that I was due for another shower. Like I always say, 2 showers a month, whether I need them or not! The weather is better this morning, and it did not snow last night for the first time in quite a while. We do have some high clouds. 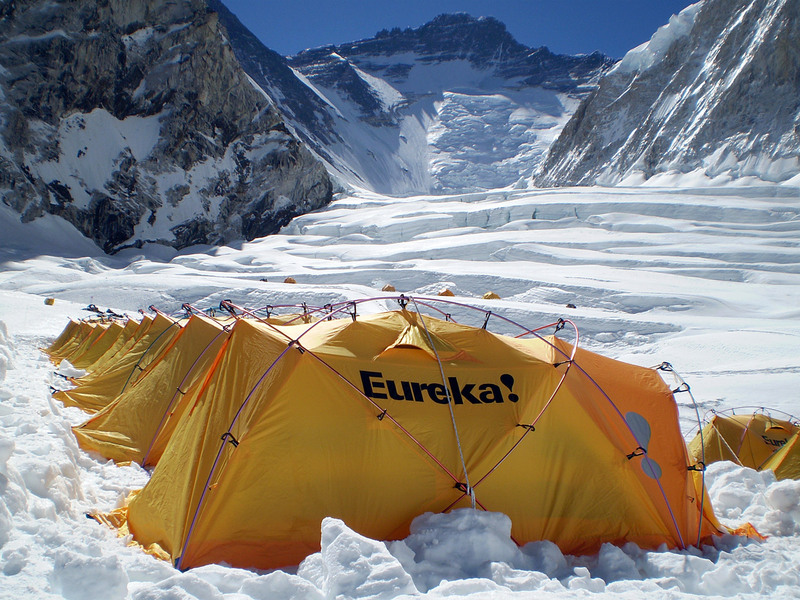 The Hybrid Team Sherpas reported no wind at Camp 1. IMG sherpas Phu Tshering and Karma Gyalzen along with 2 sherpas from Himex and 1 from Willie's team are on their way to Camp 3 right now with their goal to fix towards South Col.
We had another fixing meeting yesterday afternoon at Willie's camp. 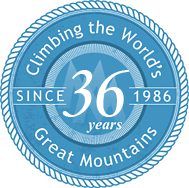 We agreed to move summit fixing gear including oxygen, tents, etc to the Col by May 5th. We figured 40 sherpa loads need to go to the Col to support the fixing. A few of us went around to various camps after the meeting asking for sherpa support to move loads to Camp 4. We are still 6 sherpas short but we have a few more camps to visit this morning. We have 31 IMG sherpas headed up this morning: two to carry personal bags to Camp 1, 7 including Ang Pasang to stay at Camp 2 today, and rest are making a round trip carry to Camp 2. Heiko and Frederico are moving to Camp 1 today. Adam Angel and the trekkers flew from Lukla to Kathmandu this morning, after being delayed one day in Lukla due to bad weather yesterday. From EBC, the weather has been less than perfect with colder temperatures and afternoon snow storms every day. One minute it is nice, and then we are all diving in a tent because of snow storms. That being said, the team has been working hard. Even with the unpredictable weather, the team has continued to get the job done. 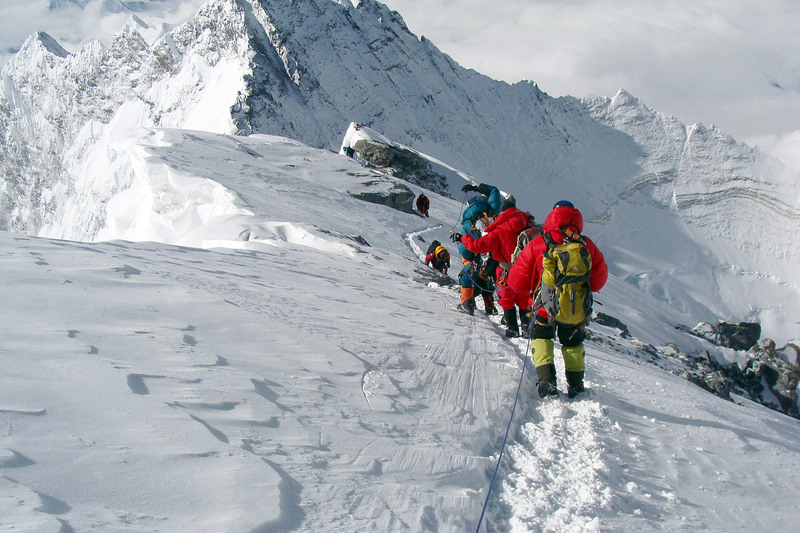 First rotations have gone great, and the Sherpas have been moving up and down the hill with consistency. 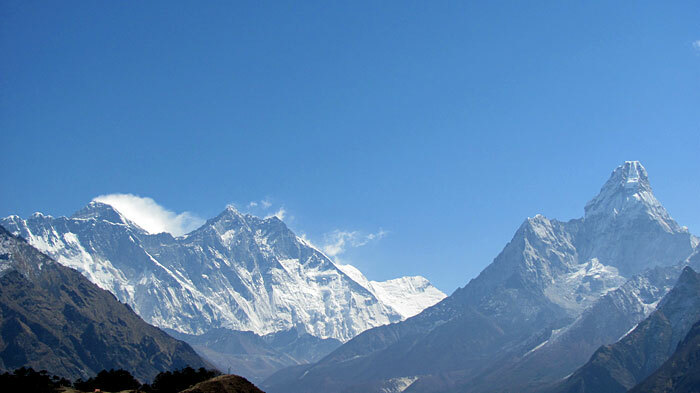 We called today the first day of spring here on Everest as we got out of bed to blue skies and warm temperatures. IMG guides Mike Hamill and Max Bunce and the Hamill and Hybrid teams started their day before sunrise though. They left Base Camp for their second rotation at 4 am and made it to Camp 1 just as the sun came up. Mike reported tonight that they had a nice day and a more typical day in the Cwm with high temperatures both in and out of the tents. Both the Lhotse team and the Classic team went through their oxygen clinics, and today they're doing some power resting to gain strength after their first rotations. The mood around camp is great with everyone reviewing their climb with each other and preparing for the next rotation. The Sherpas are running gear to Camp 2 on a daily basis, and we are looking to get Camp 3 established as soon as the weather improves and the Lhotse Face is suitable to be on. As always, the weather will dictate a lot of what we do. What we will do is be ready for our opportunity when the weather clears. There is a large weather system to the east of Everest right now pushing some moisture into the area. IMG leader Ang Jangbu reports from Base Camp that the weather turned wintery overnight, with 12 inches of fresh snow up in the Western Cwm between Camp 1 and 2. Fortunately we had the route to Camp 2 well marked with wands, so Suzanna, Graham, Mirjam, Karim, Ivan and Greg from wave 1 plowed their way down from Camp 2 this morning, breaking out the trail. 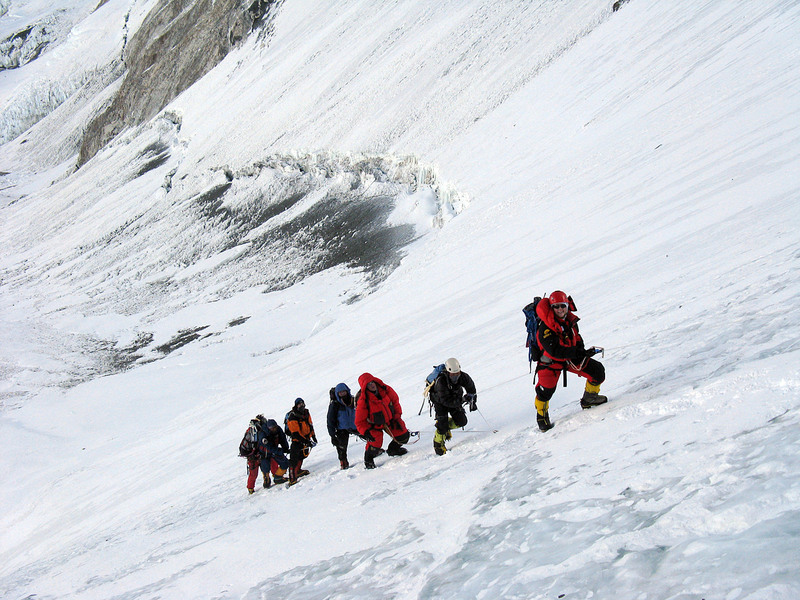 En route they met the 24 IMG sherpas carrying oxygen up to Camp 2. Alan, Simon, David, Gineth, and Jay are staying up at Camp 2 another night. 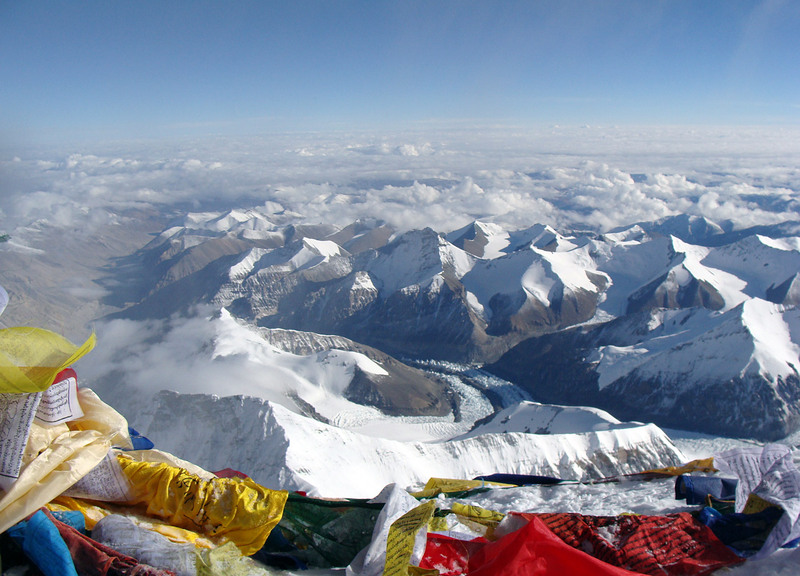 Eben's C2/C3/Lhotse climbers are at Base Camp now, and will be doing training and oxygen equipment practice today. Mike Hamill and the Hybrid team are wrapping up their rest days and are shooting to go back up on their next rotation tomorrow, weather permitting. 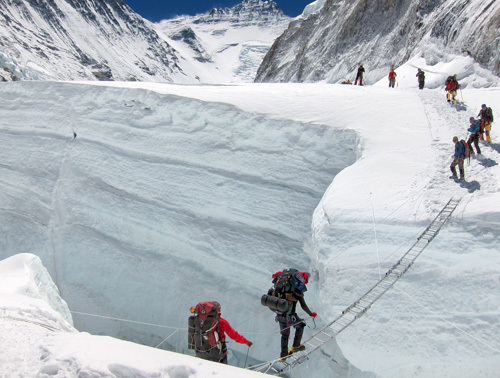 The Fixing Sherpas got rope fixed up to base of the Yellow Band today. Now they are coming down to Base Camp for a couple days of rest. Everyone is doing well up at Camp 2. Greg Vernovage, along with the majority of the IMG climbers up there and their sherpas will be coming down to Base Camp in the morning. 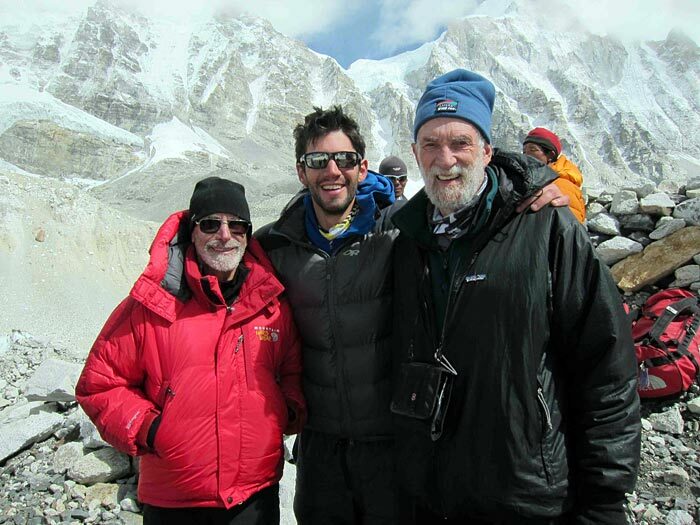 However, Alan, Simon, Jay, Dave (Express climber) and their sherpas will be up be staying up for another night or two. 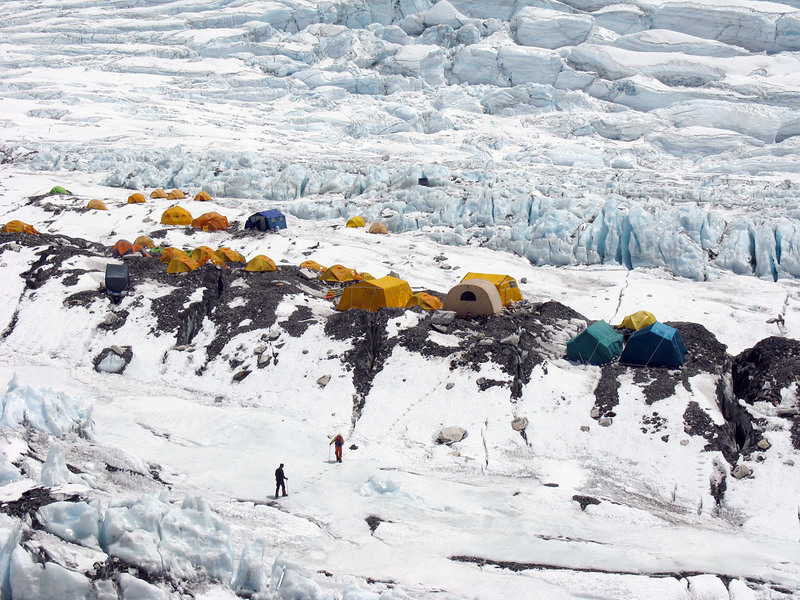 We have 24 Sherpas carrying to Camp 2 tomorrow, mostly tents and oxygen. Eben Reckord and the Lobuche crew came back up to EBC today, after a good climb down there. 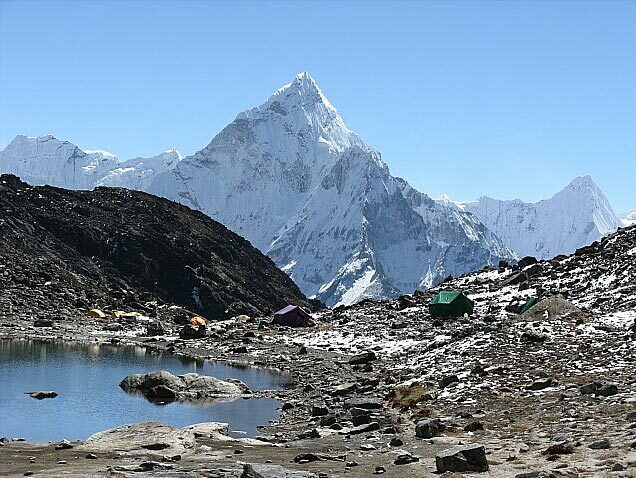 Adam Angel and his trek team reported that they successfully crossed Cho La pass into the Gokyo valley and are making good time as they head back via an alternate route (right below Cho Oyu). IMG Sherpas Phu Tshering and Karma Gyalzen (working with the fixing team) had an excellent day yesterday, reaching all the way to Camp 3 and claiming our campsite. They are taking a well deserved rest day today, then tomorrow plan to continue working fixing above Camp 3 towards the South Col. 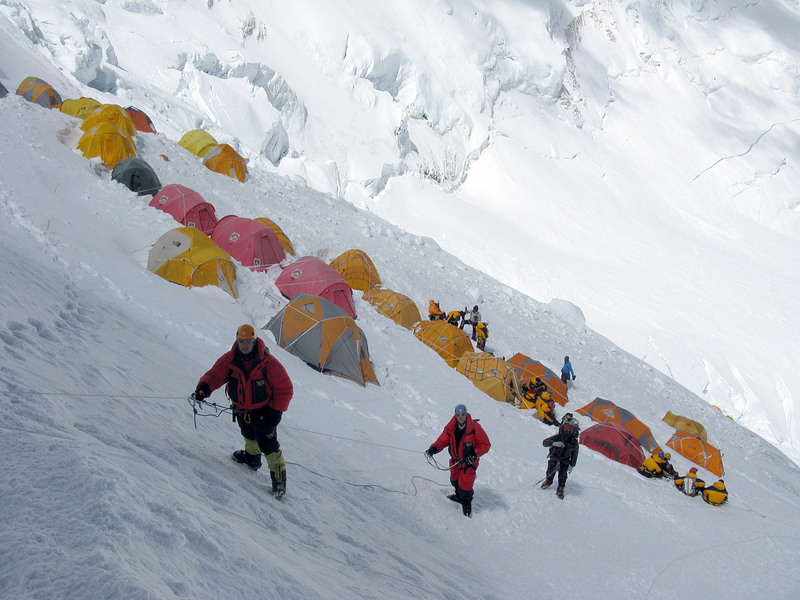 Some of the Classic climbers moved up to Camp 2 today, while some are taking another night at Camp 1. Camp 2 sherpas came down to Camp 1 to pick up member personal gear and assist with the move. We have 7 other sherpas carrying from BC to Camp 1 and Camp 2. 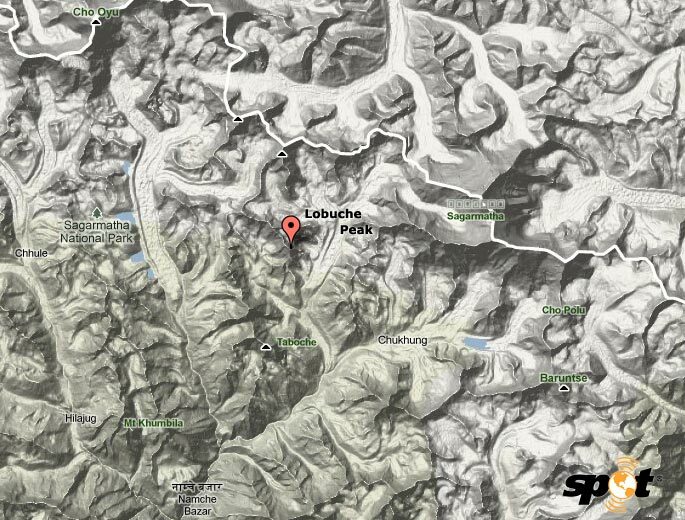 Down at Lobuche Peak, IMG guide Eben Reckord reports that the team had a good climb today and are back to the base camp. All is well so far. We will keep you posted. Ang Jangbu reports that the winds have died today, which has allowed the fixing sherpas to start work on the Lhotse Face. Up at Camp 2, the team is finally getting a respite after fighting the wind the last couple days. Mike and the Hybrid team left Camp 2 at 5:20 this morning and safely descended to Base Camp. Greg and his team had good night at Camp 1 and will be taking a small hike in the Western Cwm today, with another night at Camp 1. 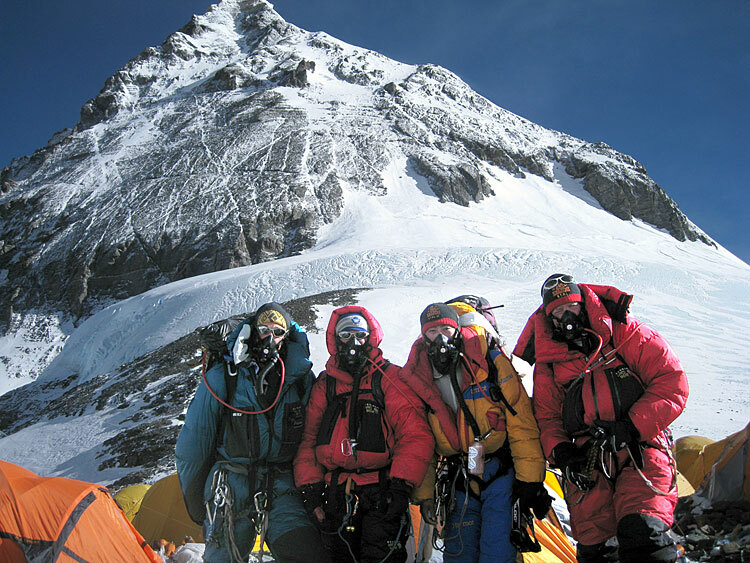 The second group of Classic climbers, Steve, Jeff, Zach, Gineth, Rich and their sherpas climbed to Camp 1 today. Adam and the EBC Trek team left base camp this morning and are headed for Dzongla (they are heading back via Gokyo valley). 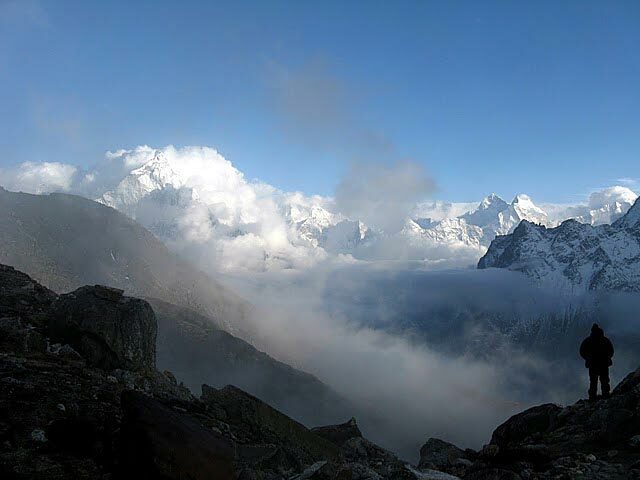 Eben reported his team down at Lobuche Peak are doing well and have moved today to the high camp. They will be heading for the summit of Lobuche tomorrow morning. Ang Jangbu reports continuing high winds on Everest, as the jetstream stays close. 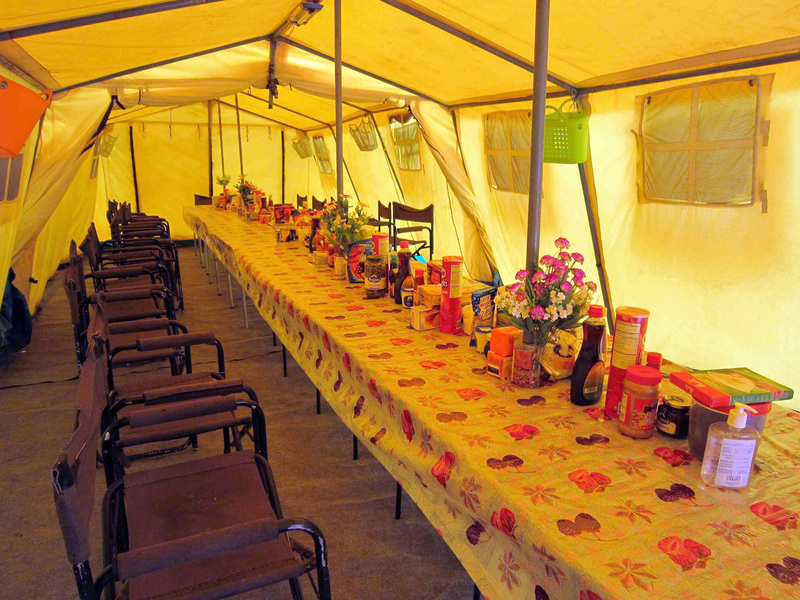 One of the dining tents at Camp 2 took a beating, but the sherpas got it fixed. We have a lot of IMG climbers and sherpas moving today. Our first wave of the Classic team (Graham, Suzanna, Mirjam, Jay, Karim, Ivan, Simon, Alan and Greg Vernovage) left BC at 4am and had a good climb up to Camp 1. We also have 4 Sherpas carrying to Camp 2 and Phu Tshering and Karma Gyalzen are moving up to Camp 2 to join the fixing team tomorrow on the Lhotse Face. We have 4 other Sherpas carrying member personal gear to Camp 1 and the 6 Sherpas now up at Camp 2 came down this morning to assist the Hybrid team for their move up to C2 today. Also moving up today from BC are additional Camp 2 cooks Purna and Pema. The C2/C3/Lhotse members Mark, Tom, George, Dennis, Jay and Mario along with Pasang Thamo and Thunang are headed down to Lobuche Peak after a mini Puja at EBC this morning, and they will be meeting up with Pemba Dorje and IMG guide Eben Reckord there for their training and acclimatization climb. Our IMG weather forecaster Michael Fagin called for high winds aloft and he was correct: the jet stream is right over Everest now with blustery conditions at all elevations. Several teams have apparently lost tents at Camps 1 and 2, but our IMG sherpas were able to keep our camps secure, despite winds gusting in excess of 50 mph. For our big dining tents at Camps 1 and 2, we use steel framed structures with both an inner tent and full coverage outer tent that goes all the way to the ground. Then, they put ropes over the top of the whole thing and tie it all down to big rocks. We had ten sherpas carry to Camp 1 today and five to Camp 2. 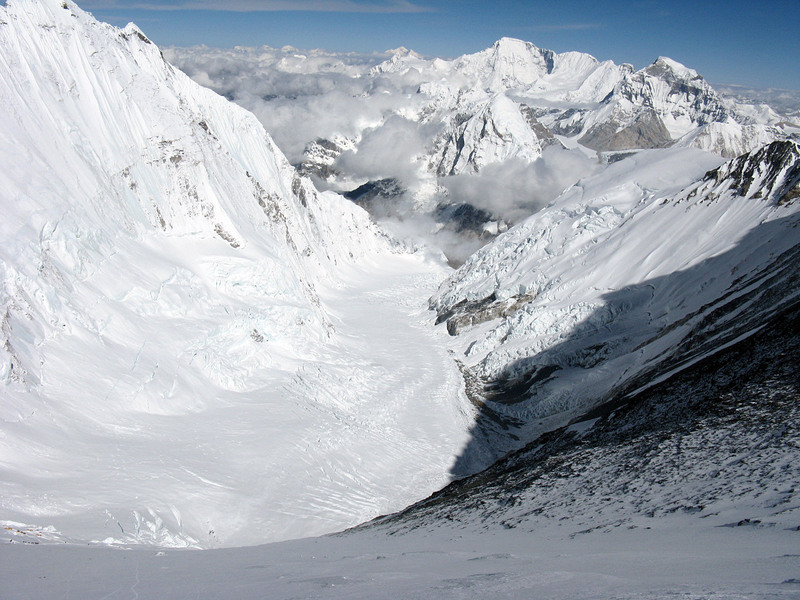 The Hybrid team left EBC at 3:45am this morning and IMG leaders Mike Hamill and Max Bunce report that they had a smooth trip up the Icefall, reaching Camp 1 in 5½ hours, which is a good time for the first trip up. This is how all that acclimatizing with the long trek to EBC followed by Lobuche Peak climb really pays a big dividend  members are able to shave several hours off the otherwise usual Icefall times. IMG leader Greg Vernovage reports that Classic team members Suzanna, Mirjam, Jay, Graham, Simon (climbing Lhotse), Karim, Ivan, Rich, Zach and Greg and their personal sherpas also headed up into the Icefall early this morning for a training run, then they returned to BC after going partway up. One more rest day, and then they will be heading for Camp 1 too. Adam Angel pulled into Base Camp today with his team. Congrats to all of them, getting to EBC is a big milestone! 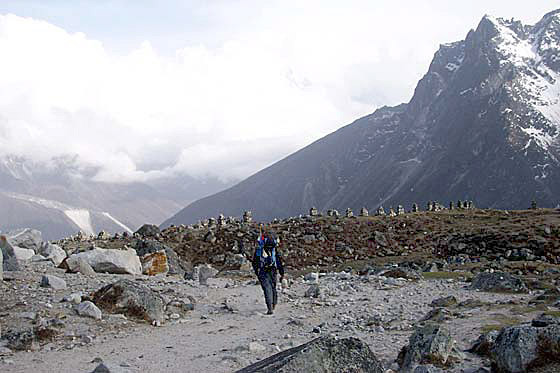 After leaving Gorak Shep, they climbed Kala Pattar, then traversed to Pumori Base Camp, before dropping down to the moraine and heading up the glacier to BC  an interesting hike! IMG leaders Ang Jangbu and Greg Vernovage report that plans for fixing the Lhotse Face and above are proceeding smoothly. 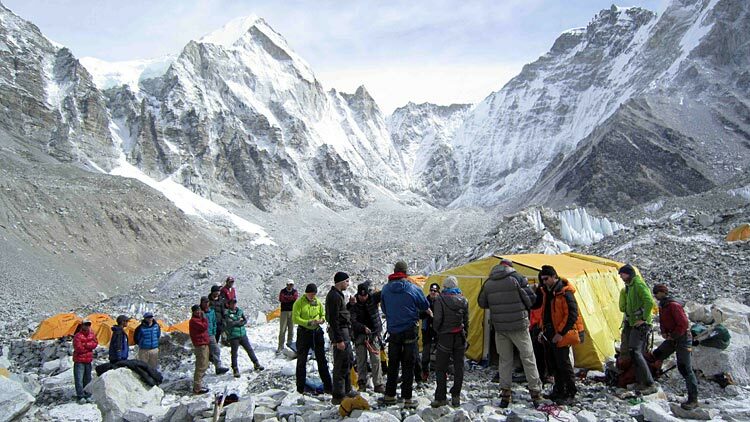 Contrary to other published reports, they say that the leaders' meeting at Base Camp was very amicable and that the plans were discussed and agreed upon with zero problems among the various teams. It is a credit to all the teams working together  thanks to all the climbers who are a part of this effort! Each year there are a few teams that don't want to work together, but this number is getting fewer and fewer each year. Starting last year we (the teams that come each year) decided it was simpler to have one team buy all the rope and then everyone would contribute on a per-head basis. 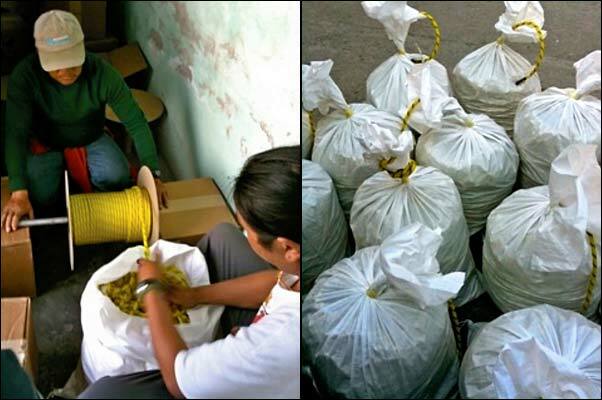 In 2010, IMG bought the rope and shipped it to EBC from the US, while Henry Todd supplied the hardware. This year Russell Brice bought all the rope (about 7800 meters total, from Europe, predominantly 10mm) and Willie Benegas bought all the hardware. All total, 53 loads of fixed rope and gear have been transported to EBC. Now, the various teams are all working to haul this gear up to Camp 2 by April 23, when the fixing will begin (IMG will be responsible for carrying 9 of the loads to C2). 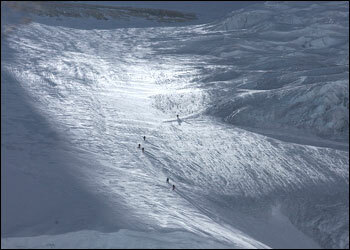 Hopefully the route will be opened to the South Col by the end of April. Pickets will be used in the snow and screws and V-thread anchors for the ice. For the rock sections, the fixing crew will continue the efforts of the last several years to keep replacing the old piton anchors with bolts. The goal is for the new ropes to be as secure as possible and for the unsightly old ropes to be removed and carried down for proper disposal. Also, to prevent traffic jams, we will continue the efforts of the past few years to fix double ropes (one for up-traffic and one for down-traffic) on all the steep, high traffic areas (below Camp 3, the Yellow Band, Geneva Spur, South Summit, Hillary Step, etc). 40 sherpas carried to Camp 2 today, and Ang Karma, Datenji, Mingma Tsering 2, Pemba Dorje 2, Lhakpa, and Ang Nima stayed up there to do more work on Camp 2. In addition, cooks Shyam and Tashi also moved up to work on getting the C2 kitchen set up. 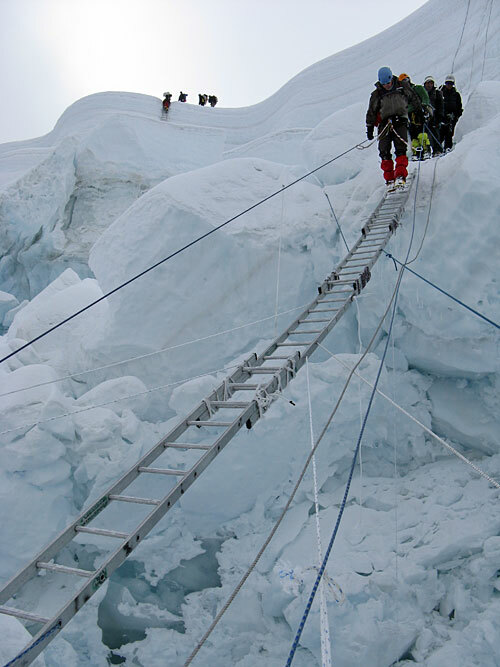 The Hybrid team headed up into the Icefall this morning to do some training before they move to Camp 1. 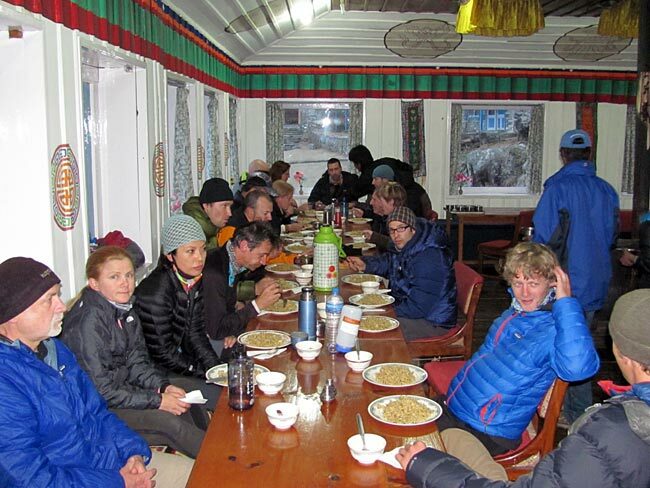 Both climbers and sherpas were back down to BC in time for a late breakfast. Eben and Justin are back down at Lobuche Base Camp getting ready for that climb with some of our team members, and Adam and his gang are moving up to Lobuche today from Pheriche. The Classic Team is at Base Camp, and this is their second full day of rest: time for more laundry and relaxation. As Jangbu and I sat in the communication tent planning the day's events, we got to talking about how communications have changed over the years. Ang Jangbu's first Everest expedition was in 1981, and on that trip the communication was two "mail runners." They would go from Base Camp to Lukla with letters. As Jangbu said, they were mostly Love Letters. He could not pinpoint the year, but he said the first sat phone to BC took up a full porter load to move it, and included a big dish antenna. 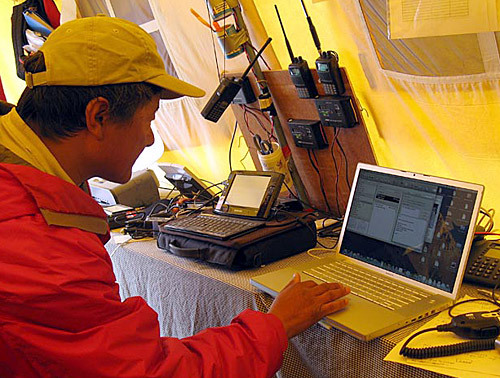 Now, we have email, cell phones, radios, and a whole tent of communication gear. Lots of changes! 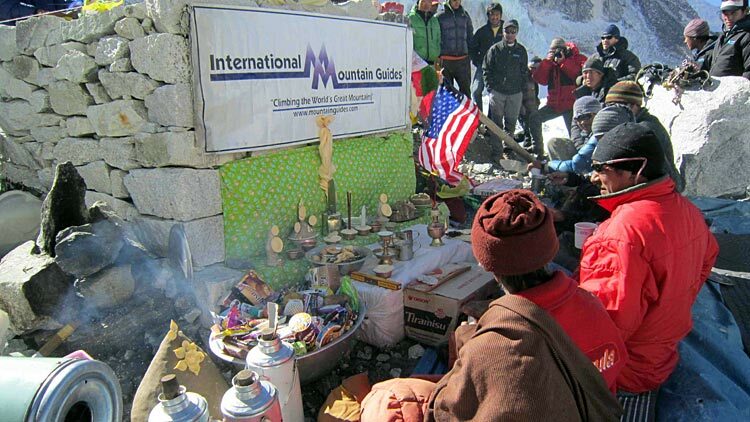 The IMG Everest expedition team celebrated their first puja today at Base Camp. By all accounts, it was a grand party, with most of the sherpas and climbers in attendance (we will have another puja in a few days, for those who missed today). The weather was excellent, and there was plenty of fun as well as good photo opportunities between the lama chanting and praying, lots of juniper and incense burning, unrolling the prayer flags, and throwing the rice and tsampa (barley flour), and the traditional smearing of tsampa on each other's faces to make a "beard" signifying long life. After that, everyone enjoyed tsampa cakes, lots of snacks, and a few rounds of drinks. 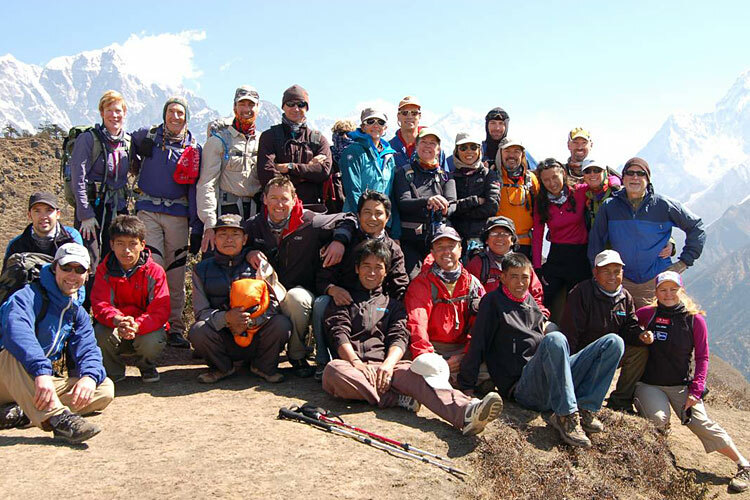 Tomorrow we have the members taking a rest/acclimatization day, and the sherpa team doing a big carry to Camp 2. IMG leader Ang Jangbu reports from Base Camp that 28 sherpas carried to Camp 2 today, which makes that camp essentially ready for occupation. Now there only remains all the oxygen to carry up there. 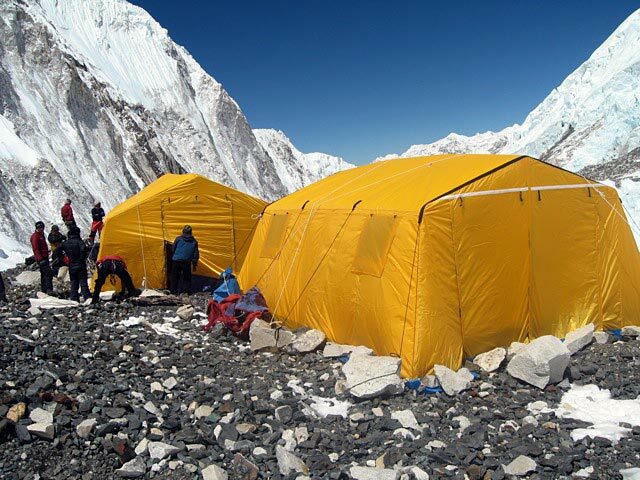 Another 2 sherpas carried to Camp 1 today and now that camp is also basically ready for climbers to occupy. Many of the Lobuche climbers have now returned to Base Camp, and after a few rest days, they will be ready to start heading up! Before they do that, the team will hold a puja ceremony tomorrow morning, to receive the blessings of the lama for safe climbing (they will hold another puja in a few days, for the climbers arriving later). 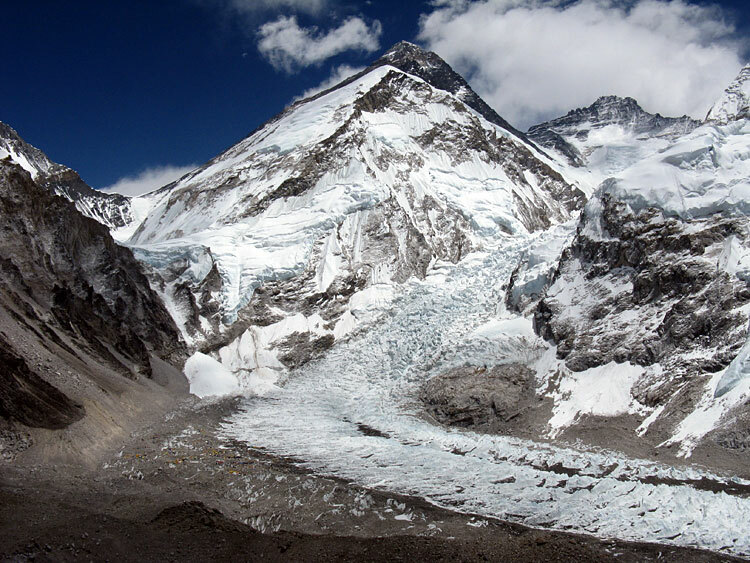 Jangbu reports that he and Russell are coordinating a multi team meeting for tomorrow afternoon, to start working on the plans for fixing the Lhotse Face and beyond. So far so good! IMG guide Eben Reckord, with Stuart and Martin (aka the Geezer Team), made it to Base Camp safe and sound. Way to go, you guys! After a day exploring the environs, the Geezers headed out via the Air Dynasty heli. 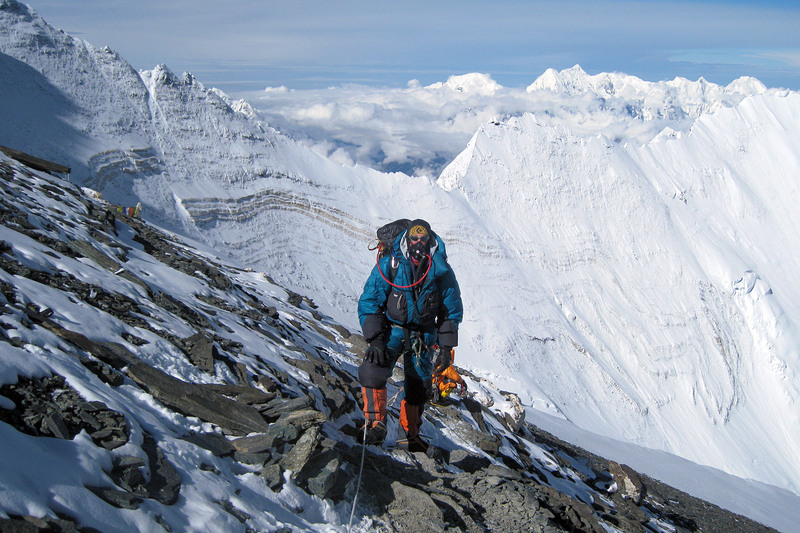 Eben will be heading down to Lobuche in the next few days to climb with the Lhotse and C2/C3 climbers. IMG Leader Greg Vernovage called on the sat phone at 8am Nepal time from the summit of Lobuche Peak to say that the Classic climbers had a nice climb this morning and are doing well (see the SPOT satellite tracking map from the summit). Further down the valley, IMG guide Adam Angel reports that all on his team are doing well at Tengboche and are heading on to Pheriche today. 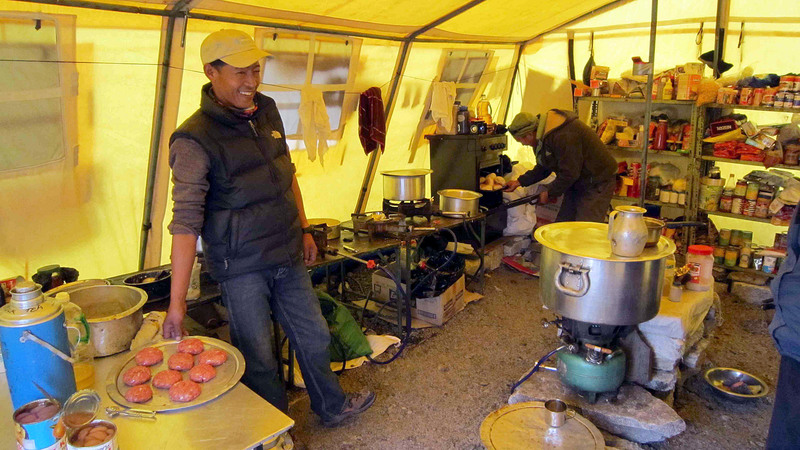 Back up at Everest BC, Chef Kaji and the other 9 sherpa cooks have our two kitchens running smoothly, with the team dining and leisure tents all ready for some serious hanging out action when the climbers get back to Base Camp from their Lobuche excursion! fantastic view of Mt. Everest. 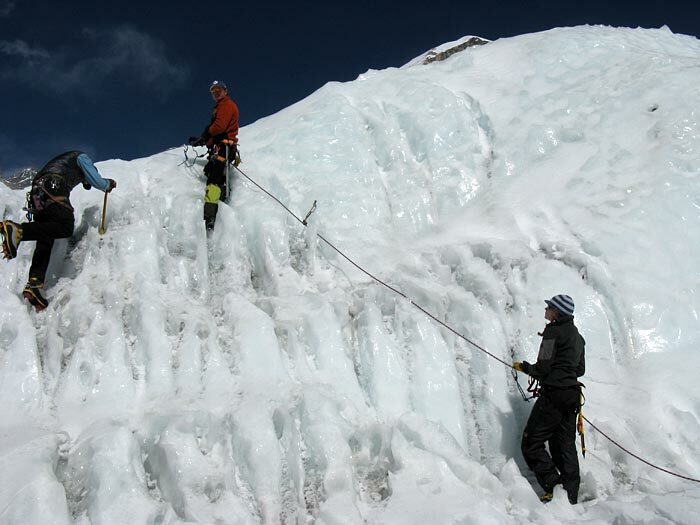 The route involves some steeper snow and ice, requiring crampons and fixed-rope skills, and it is a great acclimatization climb. We normally fix about 500 meters of fixed rope on the climb. After summiting, the Hybrid climbers descended to Lobuche BC, and the Classic climbers ascended to the High Camp for their Lobuche ascent tomorrow. On Everest we had 27 sherpas carry to Camp 2 today directly from Base Camp, so the stocking of that camp is well under way. Icefall Doctors have finished the route in the Icefall, and immediately IMG sherpas Chewang Lendu and Mingma Tenzing blasted up the hill to claim prime real estate for our IMG campsites at Camp 1 and Camp 2. That is great news! 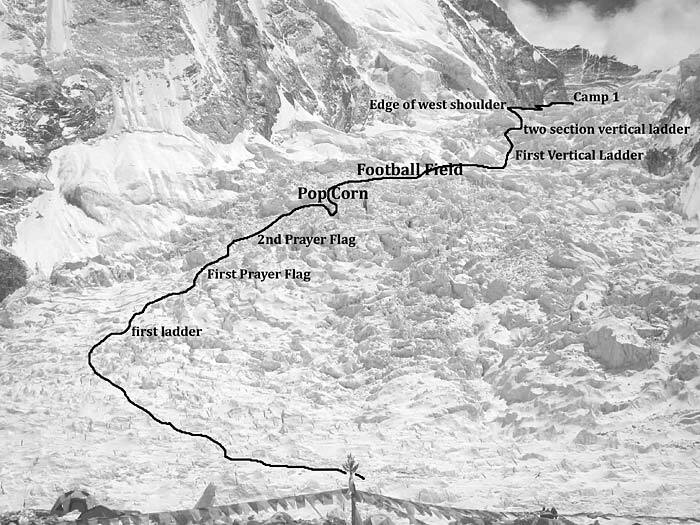 Tomorrow the sherpas do their first big carry to start building those camps. Meanwhile, the Hybrid climbers did training at BC today and head for Lobuche Peak in the morning. Classic climbers will train tomorrow and head down the next day. The Dominican climbers rolled into Base Camp today and are doing well. Eben and the Geezer Team are at Lobuche for acclimatization, while Adam and the C2/C3/Lhotse team are in Namche. Today Adam and his group did an acclimatization hike to Everest view hotel and they are all doing great. So far, so good! IMG guide Mike Hamill reports that Hybrid climbers and trekkers pulled into Everest Base Camp yesterday and everyone is doing well with only slight headaches. The 9th was Rick and Loretta's 23rd wedding anniversary, and they celebrated by reaching BC as well as with a specially made chocolate cake from Chef Kaji. Congratulations! Greg Vernovage gave a call on the sat phone to report that the Classic crew was only a couple hours out of BC and would be there later today. Other than the fact that it was snowing hard, he said everything was going well for them. Ang Jangbu reports that the sherpas have started work on the EBC heli pad, HRA has their clinic set up, and the Icefall Doctors have the route almost to Camp 1 now. The IMG Lobuche sherpa crew is working on setting up Lobuche Base Camp now, and he is sending three more climbing sherpas down tomorrow to start doing the rope-fixing to the summit. 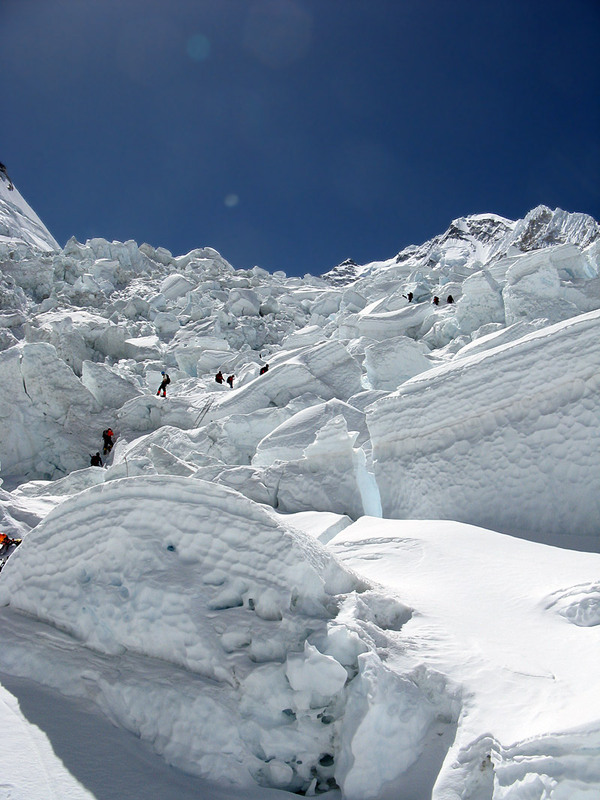 The IMG climbers will rest for two nights at EBC, then head down to Lobuche Peak the next day. 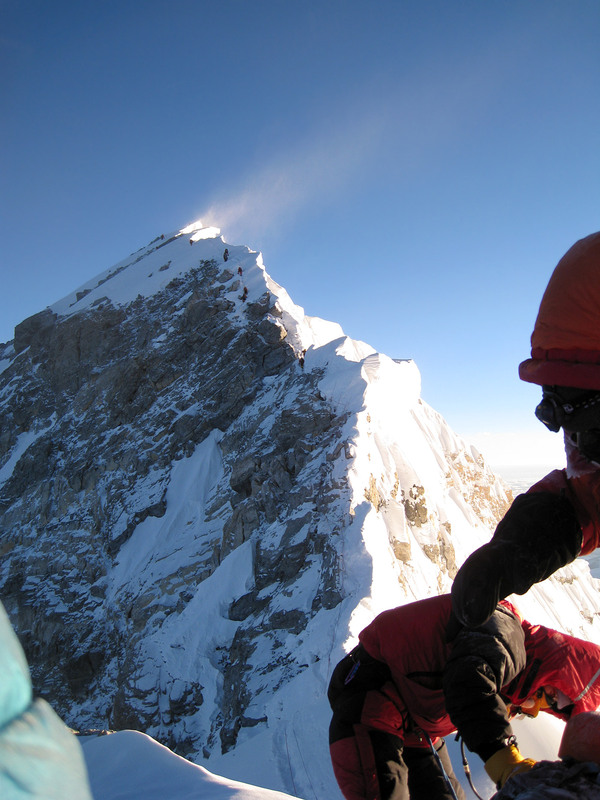 Hybrid climbers are scheduled to summit Lobuche on the 14th, and the Classic climbers on the 15th. Eben Reckord reports from Pheriche that the Geezer Team pulled into Pheriche and are doing well. He says that the first half of the day was in the snow with unusually cold temps and wind. 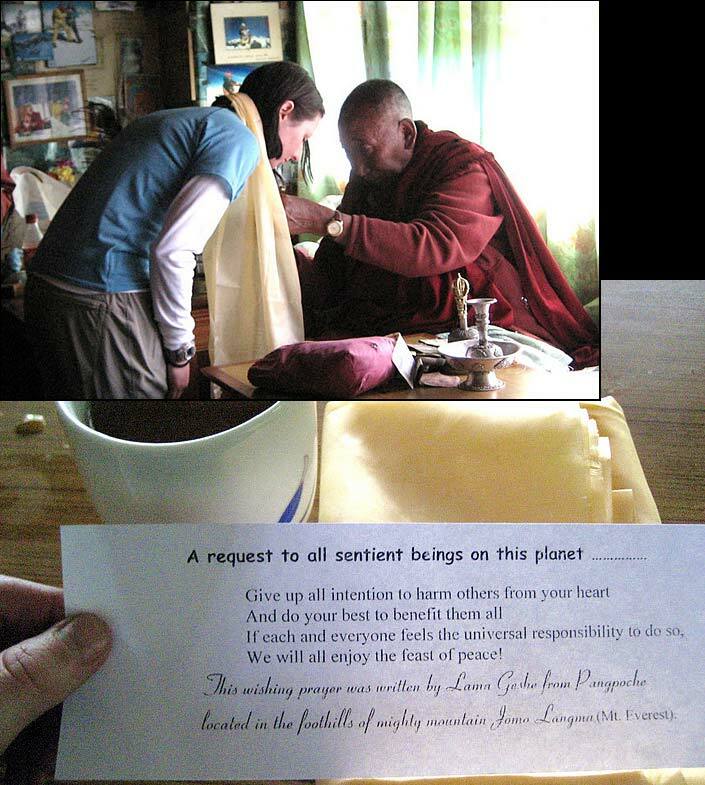 On the way, the team met with Lama Geshe of Pangpoche where they received a blessing for safe passage to EBC. They will take a rest day tomorrow. Adam Angel reports from Namche that his crew pulled into town, and his group is healthy, strong, and happy. They had a little rain, hail and thunder today, which kept the climb up the hill nice and cool. They will be taking a couple acclimatization days there before moving higher. 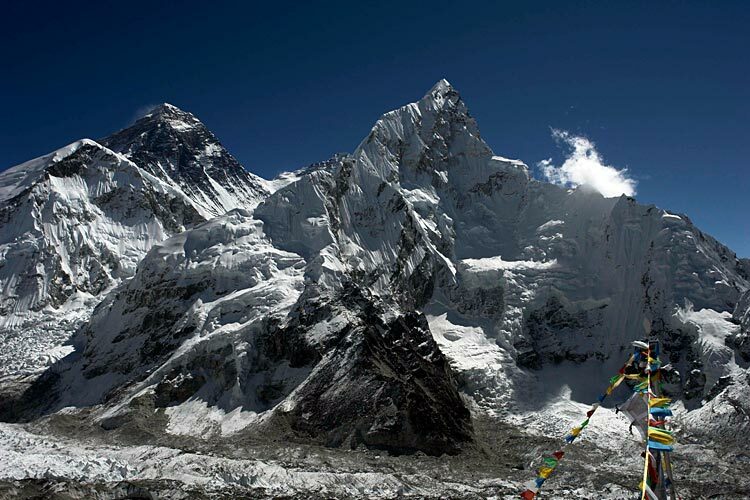 Ang Jangbu made it to Everest BC today and reports that everything is looking good up there. 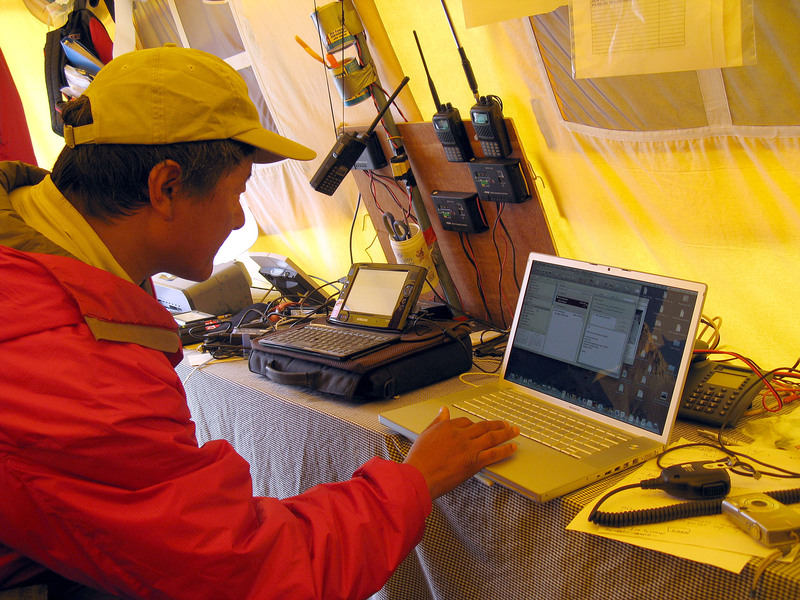 The sherpas have now all reported for duty, the tents are all up, and the communications (VHF and Bgan) are established. The Icefall Doctors are almost done fixing the Icefall, just a couple days of work left to go before the route is opened. Mike and the Hybrid team are in Lobuche and some of them will be moving to BC tomorrow. 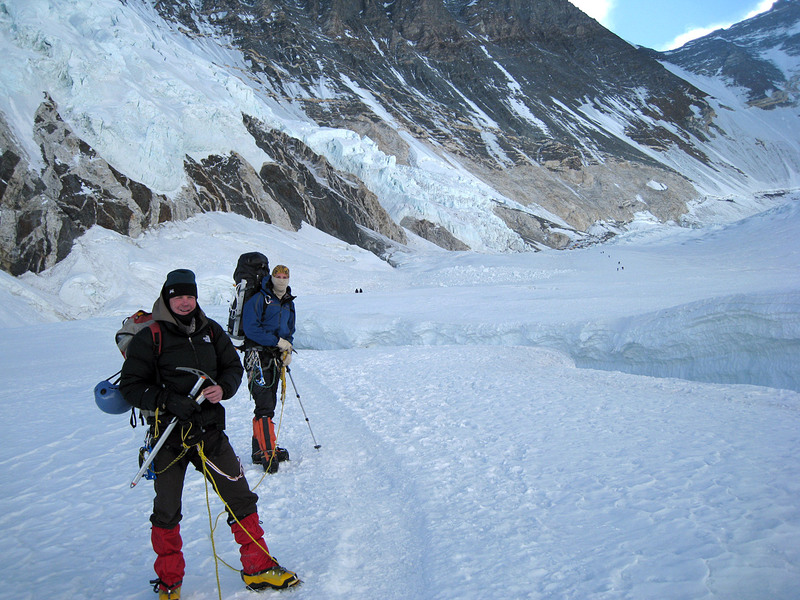 Greg and the Classic team are in Lobuche, but will be taking another rest day. The Dominican team is in Pheriche, and the Khumbu Icefall and Lobuche peak team led by Eben Reckord has reached Deboche, right on schedule. The two-man team of Stewart and Martin have given their team a name, the climbing geezers, with a 136 years between the two of them. All are in good health and feeling strong. Down in Kathmandu, IMG guide Adam Angel with the C2/C3, Lhotse, and Lobuche climbers are ready to fly to Lukla in the morning. Everything continues on go smoothly and on schedule. So far so good! The Classic Team had a great couple of nights in Deboche. On the rest day we walked back up the hill to visit the Tengboche Monastery, and while we were there, made a point to drop into the local Bakery. This group's favorite was the chocolate cake and Crazy Wacky Cake. Today, we left Deboche early and headed for Pangboche monastery, where we stopped in to see Lama Geshe and get his blessing for our upcoming climbs. 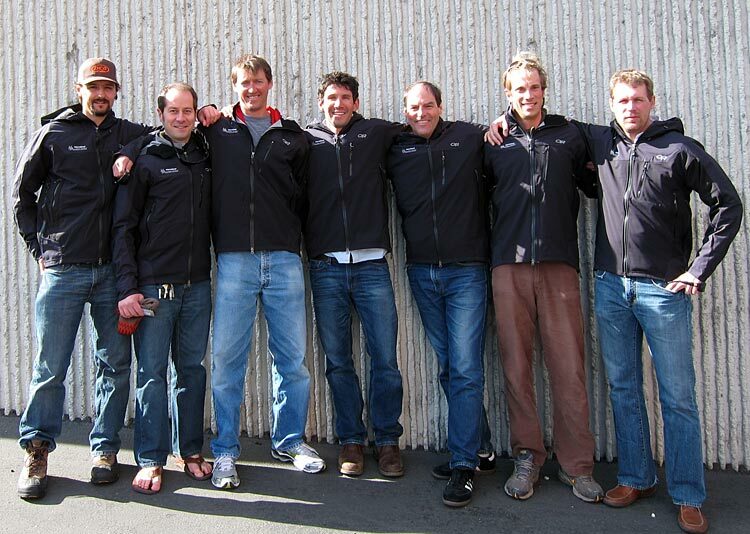 An added bonus to the visit was running into ten more of our IMG Sherpas, doing the same! After a fun visit in Pangboche, we continued up the valley towards Pheriche, eventually crossing the small pass and dropping down to cross the river, dodging a few yaks along the way. We are now entering the upper valley, and as we head into Pheriche, we can look up and see one of our first mountain objectives, Lobuche. It was a pretty sweet view of the route, and it fired up the climbers. 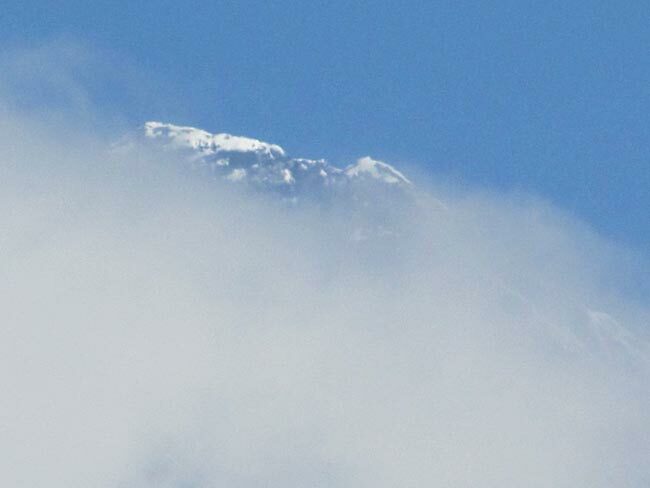 Further up the valley to the west was Cho Oyu, but it was partially hidden in the clouds today. 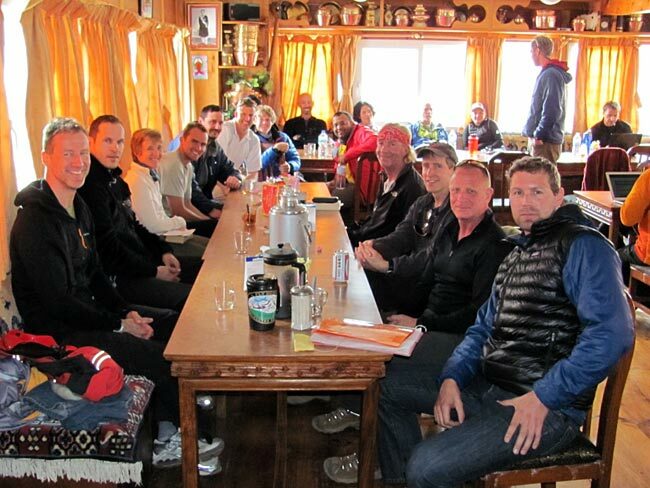 In the Himalayan Hotel, we bump into the Hybrid team again; it is always nice to see some welcome faces and teammates. We are all traveling well, and most important, we are all healthy! 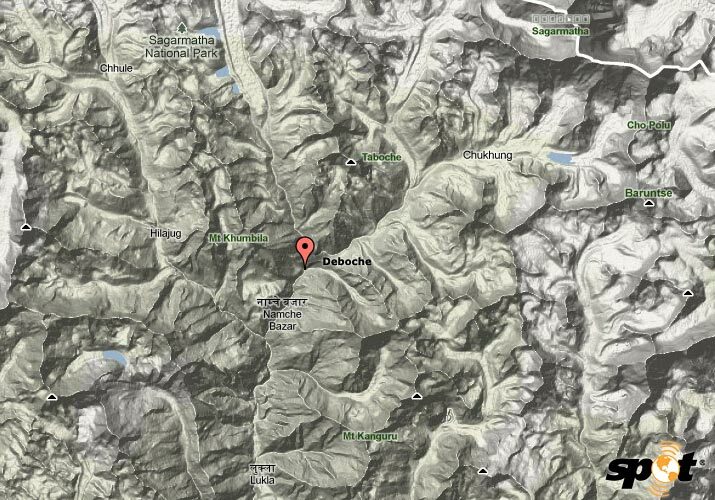 Tomorrow for the Hybrid group is to move up to the village of Lobuche. For the Classic team, a short hike up the ridge for a view of Island Peak, Dingboche and Lhotse and maybe a visit to the HRA clinic in Pheriche to see our friends at Himalayan Rescue Association. The word from some people walking down valley from Base Camp is that there has been some snow and wind up there. Translation for the IMG Team: take our time. All is well, and everyone wants to say hello to everyone back home! Everyone is where they should be right now, which is good news. Yesterday we had IMG guide Eben Reckord with Martin and Stuart fly to Lukla, and they are heading to Namche today. The Dominican Team made it to Deboche yesterday, and the Hybrid team is up in Pheriche, both on schedule, and both teams are doing well. Greg reports from Deboche that his Classic team of climbers and trekkers are all looking good and ready to move to Pheriche today. He says there was fresh snow overnight and this morning it is clear as a bell, so it is going to be an absolutely spectacular day as they walk below Ama Dablam. Today we have the first members of the April 7 team of trekkers, Lobuche, C2/C3, and Lhotse climbers arriving to Kathmandu. I will be working with them and IMG guide Adam Angel over the next couple days to make sure everyone is all set before they fly to Lukla on the 9th. So far so good! Both the Classic and Hybrid groups are spending a rest/acclimatization day in Deboche, while the Dominican Team is in Namche. After trekking from Namche up to Tengboche Monastery, the lead groups continued a short distance down the other side of the Tengboche hill into the rhododenderon forest, to Deboche, in the river valley. 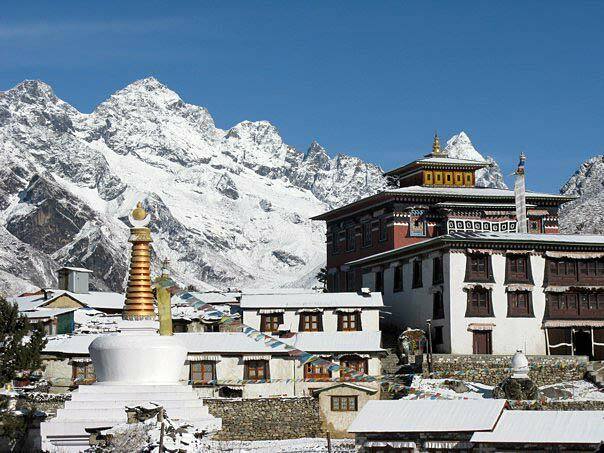 From Deboche it is easy to climb back up to Tengboche to visit the monastary on the acclimatization day, and there is also a nunnary nearby to visit. This time of the year many of the rhododenderons are blooming, making it all very spectacular. Yesterday, however, it was snowing at Tengboche (and also down in Namche), so everyone is getting a taste of what is to come! We woke up and had not a cloud in the sky. For our team acclimatization hike today we headed up to Syangboche (the small airport above town), then continued up to the Everest View Hotel for a great view of Everest, Lhotse and Ama Dablam. 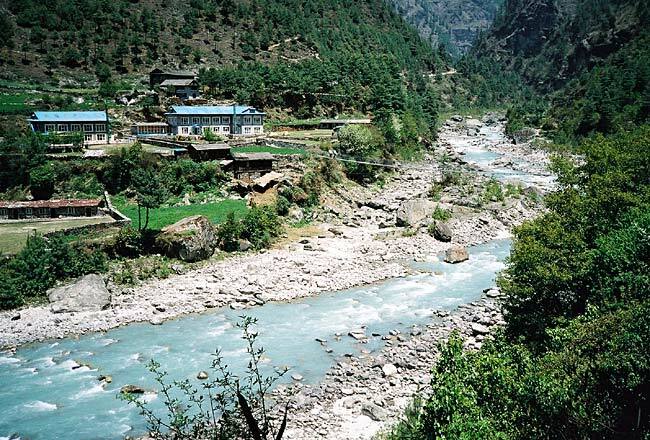 After taking in the sights, we looped back down to Khumjung and walked through the Hillary school grounds. Back in Namche in time for lunch and a few showers. Smooth sailing so far. 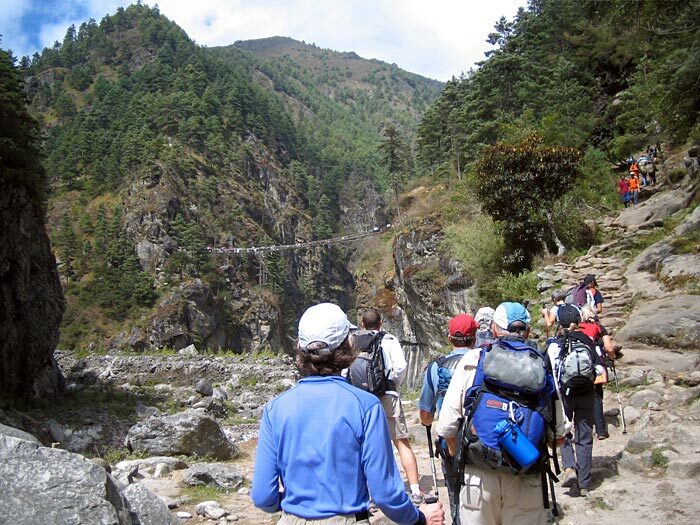 We landed with all of our bags in Lukla and hit the trail. Perfect trekking weather, cool with a few afternoon clouds to keep the sun off of us. Pulled into Phakding yesterday and relaxed outside. 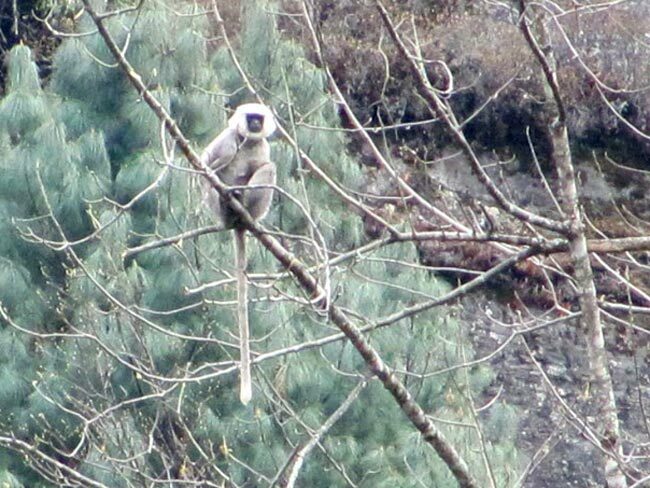 We got a big treat when we noticed a Langur monkey sitting up in the tree and looking as interested in us as we were of him. Neither Justin or I had ever seen or heard of these animals and we were fired up to get a few photos. Friday we were up early and on the trail. Good cloud cover and a cool day gave up a great opportunity to move up Namche hill. The hill is still there, and the team handled it perfectly: slow and steady. We pulled into Namche and the Khumbu Lodge, where we ran into our friends with the Hybrid group and congratulated each other on the trek so far. We are all having a great time and laughing like crazy. This morning we got some breakfast and then climbed up to the top of Namche to Sherwi Khangba Lodge where Phil's old friend Lhakpa Sonam runs the Sherpa Museum. Lhakpa says hello to all the IMG friends and especially Phil and Sue Ershler. A little further up we got our first glimpse of just the very top of Everest as it poked out of the clouds. 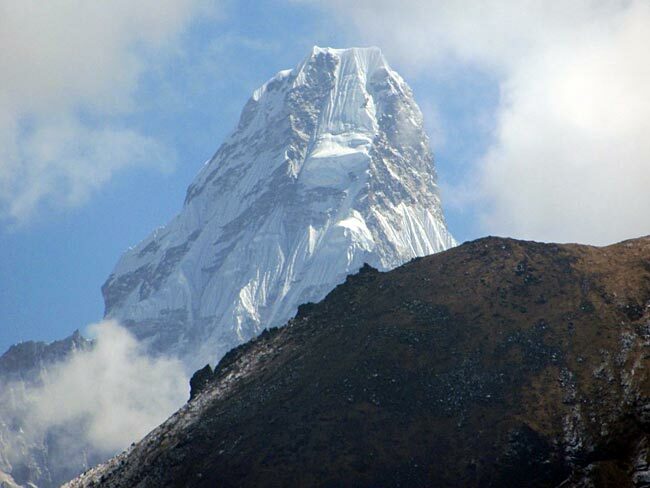 We also got a glimpse of a team favorite, Ama Dablam. On the walk down to the Saturday market, a few of our Phortse sherpas walked up. Danuru 2, Karma Rita, and Dawa gave us a quick hello as they were headed home with the weekly shopping. We will see them again once we get to Base Camp. The market was great and now we have an afternoon of rest at the lodge. All is well and everyone is doing very well. 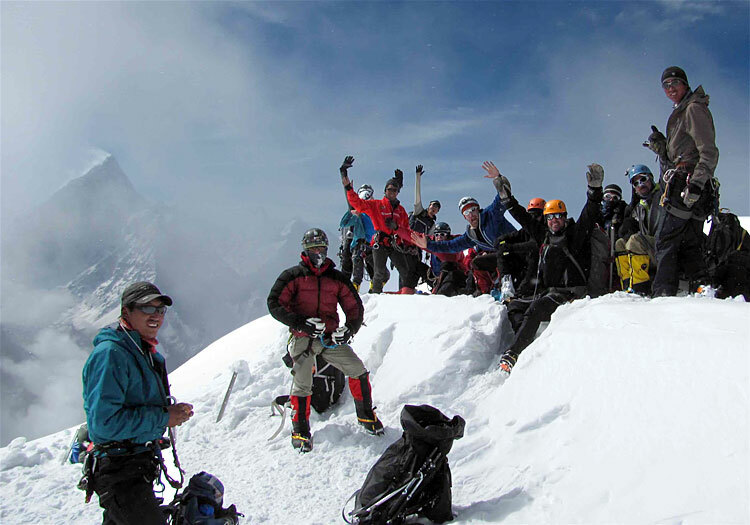 IMG is proud to be supporting The Dominican Republic's Everest Expedition. Today the Dominican climbers and their support team made it in to Lukla (after a flight delay due to bad weather in the Lukla area). 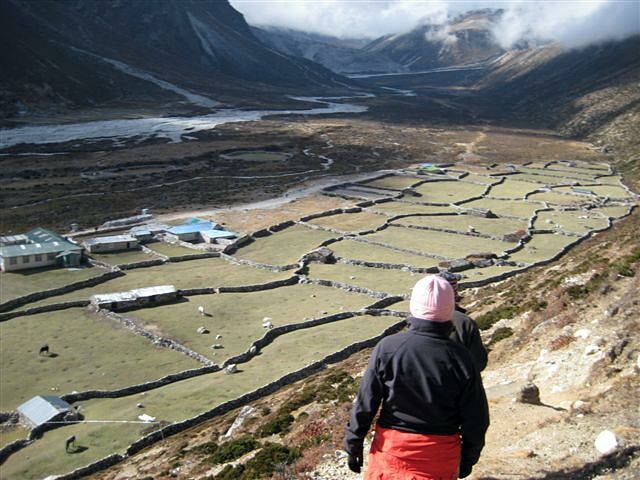 Once into the Khumbu, they met up with Panuru Sherpa and trekked to Phakding. 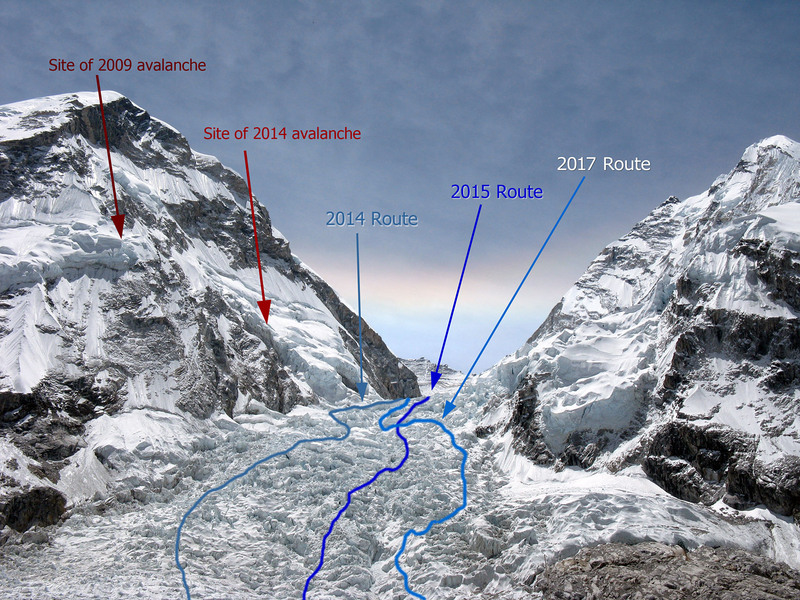 Ang Pasang reports that the Icefall Doctors (the sherpas employed by SPCC to put in the Icefall route) are making good progress and now have the Icefall route fixed up to the Popcorn (about half way up  see the route). 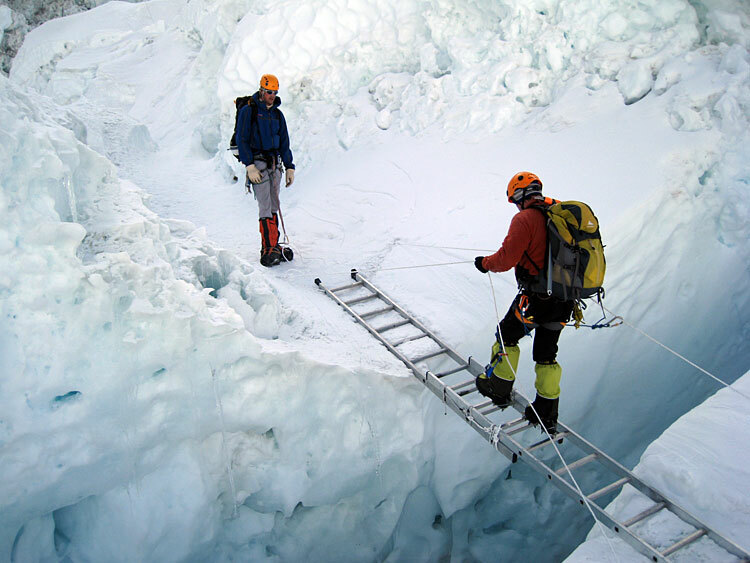 The second half of the Icefall is more difficult, so we guesstimate that they still have another week of work ahead of them. So far so good! IMG guides Greg Vernovage and Justin Merle, along with the Classic Climbers and Trekkers, got up early this morning. After a quick breakfast they loaded the bus at 5am for the trip to the airport. The flights went on schedule, and by 8am the whole team and all their luggage was successfully in Lukla. 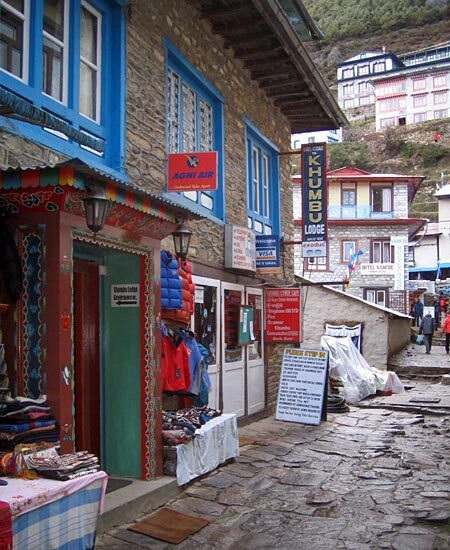 After hitting the bakery in Lukla for some tasty treats, the team is on the trail, headed for Phakding today. Expedition Sirdar Ang Pasang reports from Base Camp that most of the tent platforms are now done and he will be coming down to Namche tomorrow to meet Mike and Greg do the team's registration with the SPCC (for the Icefall permit fees and counting the number of oxygen bottles and fuel cartridges for the garbage deposit). The weather is good and everything is going smoothly, so we are all psyched that the trip is off to a great start. Everyone made it safe and sound to Kathmandu, with no missing luggage, which is a great way to get a trip started! Last night we took over the poolside cafe at the Radisson Hotel for a private welcome dinner party. Between the open bar, big barbeque dinner, lots of introductions and good conversation, we all had a great time. For me it was really satisfying to finally meet in person a number of people with whom I have had many phone calls and emails over the past year. This morning IMG guides Mike Hamill and Max Bunce had their Hybrid Team up early for the flight to Lukla. 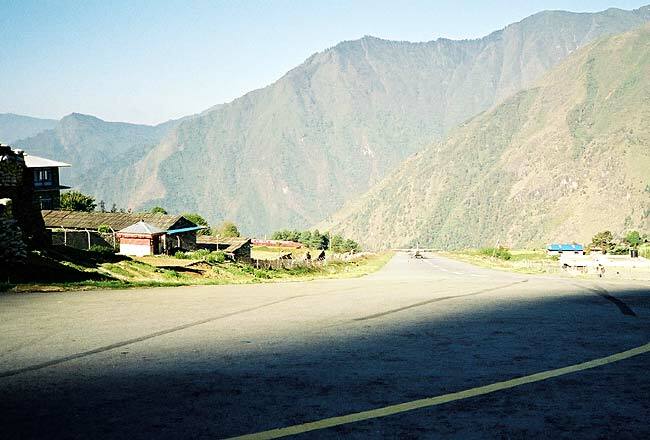 After a 4:30 am breakfast at the hotel, it was off to the airport for the 45 minute flight to Lukla. 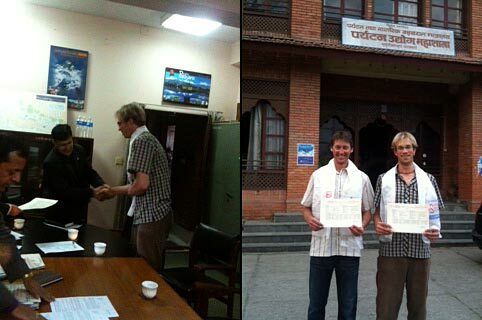 IMG guides Greg Vernovage and Justin Merle did the briefing at the Ministry today, and received our official Everest permits. 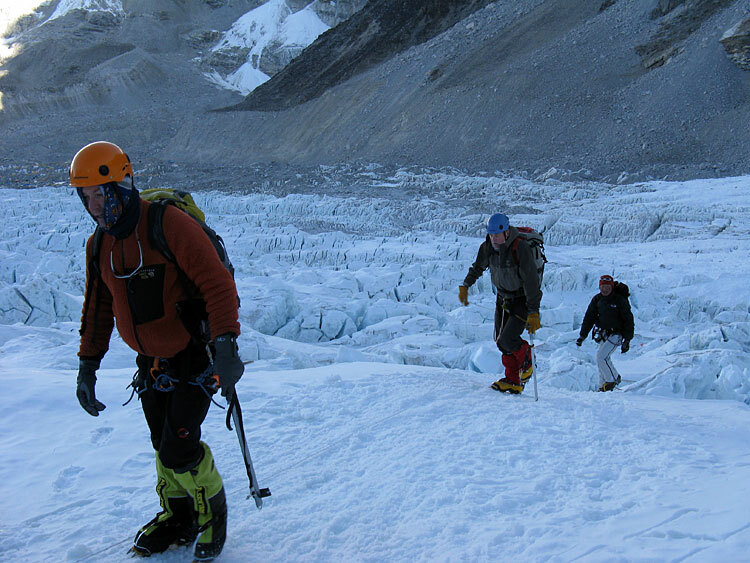 The 2011 IMG Everest Expedition has now officially begun. 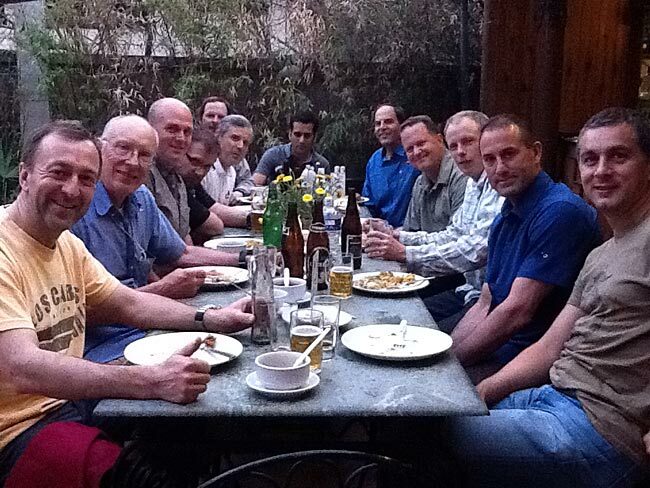 The team members will be arriving in Kathmandu over the next couple days, and we will have our team welcome dinner on the evening of the 29th. So far so good! 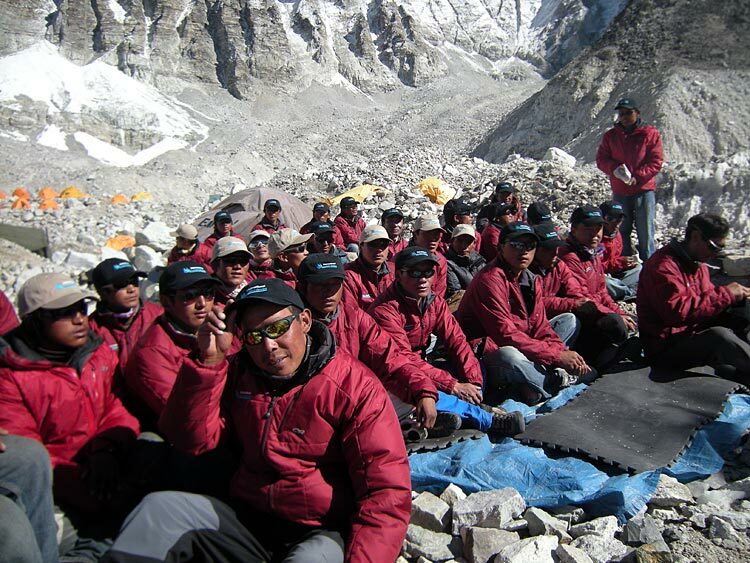 IMG Everest Guides Ready to Go! We had our final guide meeting yesterday, and Merle, Hamill, and Vernovage are heading out the door to Kathmandu tomorrow, with the rest of us following over the next couple days. Next stop, Kathmandu! Up at Everest Base Camp, Chewang Lendu (4-time Lhotse summiter) called to report that the weather has been clear and windy, and that the Sherpa team has been making good progress building the camp. So far, they have managed to built the platforms and erect the Sherpa kitchen and dining tents, the member kitchen tent, one of our two big Eureka MGPTS US Army tents (eurekamilitarytents.com), and one big storage tent. Now they are working on building the sites for the big, member dining tents and communication tent. After that, they will start on all the platforms for the sleeping tents. Chewang reports that the SPCC (Icefall doctors) and a handful of other teams are now at BC also working on their camps. 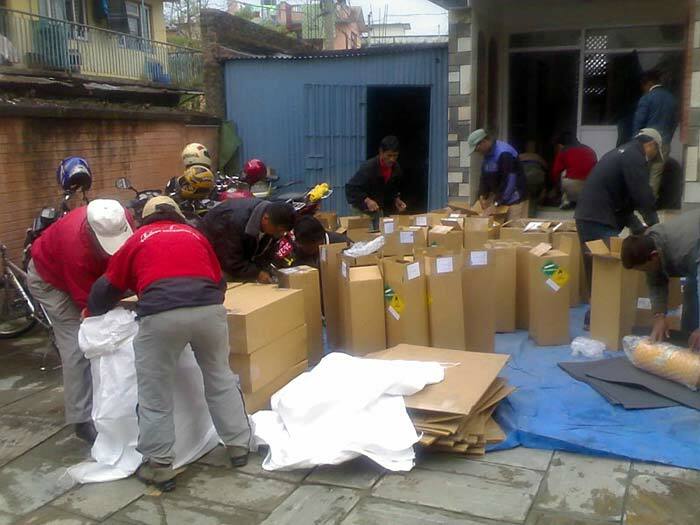 Our third shipment of food and gear has now reached Kathmandu, and everything is moving forward on schedule. With the conclusion of the Losar Festival (Tibetan New Year), ten more IMG sherpas and two cooks are heading to Base Camp today to continue work on the tent platforms. Every year we have to literally carve the camp out of the rocks and ice of glacier, which is constantly moving and changing. The sherpas will be making spaces for a number of very large kitchen, dining, and socializing tents, dozens of sleeping tents, several shower tents, toilet tents, storage tents, and our communications nerve center. It takes lots of chopping ice and prying, pushing, lifting, and rolling the heavy stones to build a spectacular Base Camp! Welcome to our 2011 expedition and online coverage. 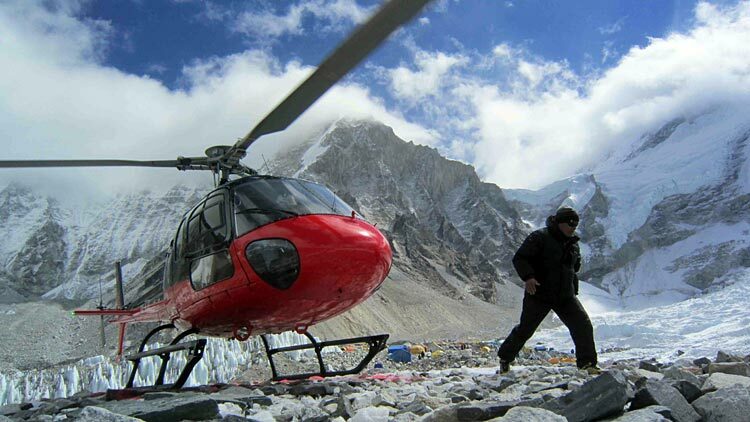 We are looking forward to another good season on Everest and the surrounding mountains. Everything is coming together on schedule: our teams are complete, our guides and sherpas have been selected, the permits secured, and the food and gear have been shipped to Nepal. The climbers have done their training, and here at IMG, we have done our homework. Now it is time for preparation to meet opportunity! 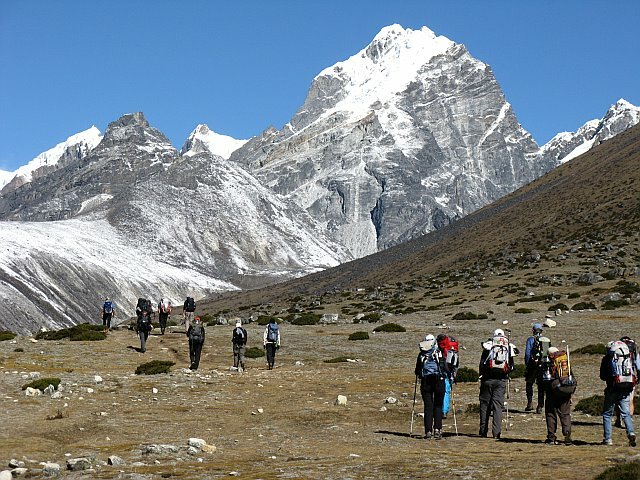 For 2011 we have our Classic, Hybrid, Lhotse, C2/C3, Lobuche, and Everest Base Camp Trek groups. 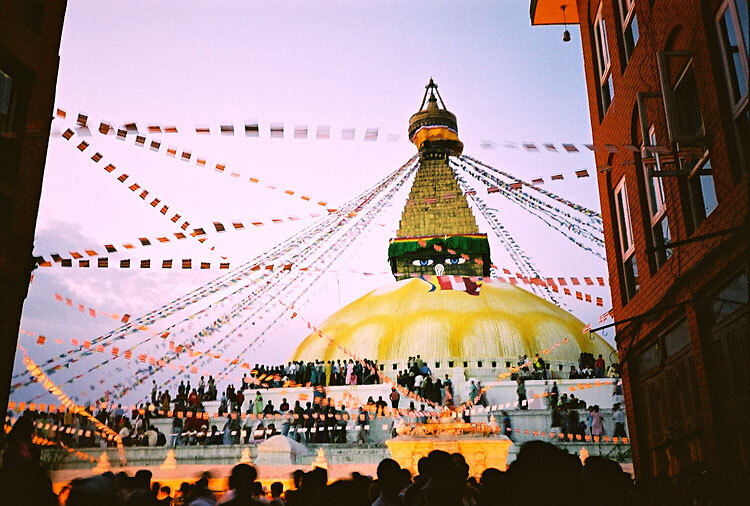 Everyone will be meeting late March/early April in Kathmandu for the trip to Base Camp. The Sherpa team, under the direction of Ang Pasang and Ang Jangbu, have already been to EBC to claim our spot and start working on the camp. 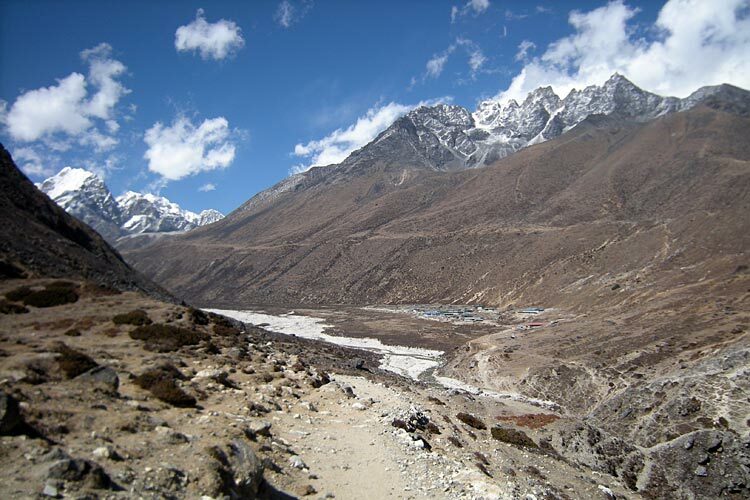 We have already sent two flights of supplies into Khumbu and these goods are now moving up the valley by porter and yak. 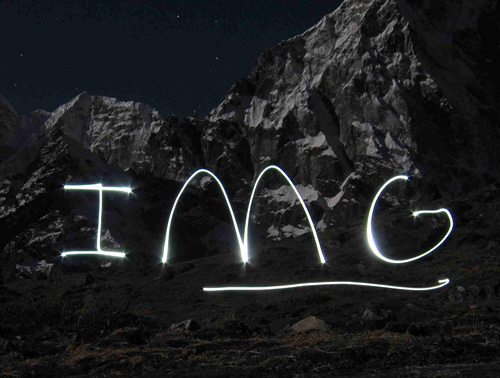 On behalf of all of us here at IMG, thanks for your interest in our expedition. Over the next several months, we'll look forward to keeping you up to date on the progress of our expedition teams.